Istanbul – the only city that lies on both continents – is a place of wonder, curiosity, immense cultural tensity, history, architecture, food and human density. It is a place to be visited by everyone at least once in their lifetime, and it won’t leave you adamant or unbiased. It is a megapolis that, to some extent, carries on the traditions of a legendary city of Constantinople, its heritage, arts and tales. I have already visited Istanbul in 2000 as a law student and I, frankly, hated it. Not the city, but the obnoxious, stalking Turkish men who followed me around. I was 20 years old, it was my first cultural experience outside Belarus, and even though I enjoyed the museums and sights, I preferred to stay at a hotel. I am glad I’ve been given another chance to visit this place (even as a layover from Malta to Belarus) as it changed my entire perspective of the city (but not the Turkish men, sadly). Before I begin, I would like to thank Tanya and her Frenchman friend Nico for making the best out of my 24 hours in Istanbul! Istanbul is one of the most populous cities in the world (14 million people) and is Turkey’s economic, cultural and historic center. Once I had a conversation with a group of Oxford dons who twice a year travel to see the most interesting historical/cultural sites in the world and they told me that Turkey was one of their most visited places. Indeed, the country’s strategic location between Asia and Europe left us many vistas that have seen and survived the great empires of the Persians, Romans, Byzantines and Ottomans. It all culminates in Istanbul – the final stage of the legendary Silk Roads. However the turbulent history of Istanbul is full of contrasts and contradictions. Once, the capital of the Eastern Roman Empire, it was the stronghold of Christendom, now, it is predominantly Muslim; a place that for centuries was the world’s largest market tolerant to cultures and religions, in April 1915 it became an opening act of the Armenian Genocide, the first systematic ethnic cleansing in the human history. 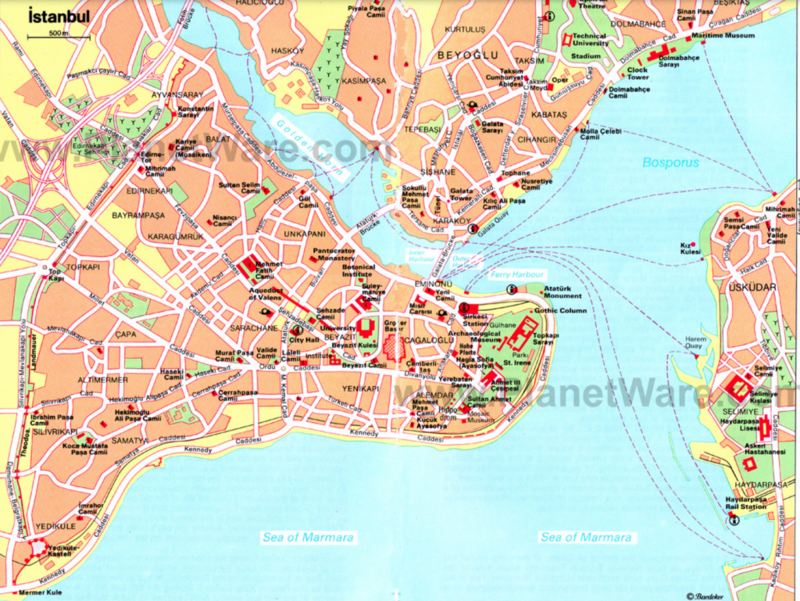 Now, buckle up and let me take you through the history of Istanbul. The history of the city proper begins in 667 B.C. when Greek settlers from Megara established Byzantium, named after their leader Byzas, on the European side of the Bosphorus. The settlers built an acropolis adjacent to the Golden Horn on the site of the early Thracian settlements, fueling the nascent city’s economy. It had port and a sheltered cove, and prospered due to its key geographical position: Byzantium not only had strategic water access, but also was located on the busy trade route to Greek colonies around the Black Sea. While Byzantium was founded within recorded history, recent excavations for the Bosphorus tunnel project (an interesting read “The Big Dig” by the New Yorker) uncovered artifacts from a Neolithic settlement dating between 6400 B.C. and 5800 B.C. In 512 B.C. Darius, emperor of Persia, captured the city during his campaign against the Scythians. It was during that time when people first attempted to bridge the Bosphorus Strait (by tying the boats one to another), which is only 0.8 km wide in its narrowest point. Following the retreat of the Persians in 478 B.C., the town came under the influence and protection of Athens and stayed under the Athenian rule until 355 B.C., when it gained independence. By the end of the Hellenistic period, Byzantium, retaining its status as a free state, had formed an alliance with the Roman Empire. Life was relatively uneventful until the city’s leaders made a big mistake by picking a wrong side in a Roman war of succession. After siding with Pescennius Niger against the victorious Septimius Severus, the city was besieged by Rome in A.D. 193 and suffered extensive damage; Byzantium citizens were massacred and walls were burnt and raze to the ground. Ancient Byzantium was no more. Soon realizing the city’s critical importance, Severus had Byzantium rebuilt on an even grander scale, adding a circuit of walls enclosing a city twice the size of its predecessor. Severus named his new city Augusta Antonina, in honor of his son. Roman Emperor Diocletian had decreed after his retirement, the government of the Roman Empire should be overseen by co-emperors Galerius in the east (Augusta Antonina) and Constantine in the west (Rome). Of course, it resulted in a civil war, which was won by Constantine in A.D.324 who became sole emperor of a reunited Roman Empire. Constantine decided to move the capital of his far-flung empire from a declining Rome to a more strategic, powerful position in the east and in 330 he declared Byzantium to be Nova Roma (“New Rome”), but it was widely referred to as Constantinopolis (or Constantinople) – the city of Constantine. Thus began the Eastern Roman Empire, later known as the Byzantine Empire – a synthesis of Greek culture, Roman politics, and Christian religion that would survive for more than a thousand of years. Constantine converted to Christianity (though only on his deathbed) and Latin was eventually abandoned in favor of Greek. Theodosius (rule 379-395) was the last Roman emperor to rule a united Roman Empire from Constantinople. After his death, the eastern part of the empire permanently broke away from the western part, and while the western territories succumbed to the barbarian kings less than a century later, the Byzantine continued to thrive for a millennium. From across the sweep of a thousand years of Byzantine history, one emperor stands out – Emperor Justinian (rule 527-565). Under Justinian, the Empire expanded its borders and reconquered some of the lost Roman territories in the west, including most of Italy, Balkans and North Africa. The Codex Justinianus, an unprecedented legal document of its time, regulated public and private affairs and business conduct. Also known as Corpus Juris Civilis, it later provided a foundation for the legal system of the entire western Europe. 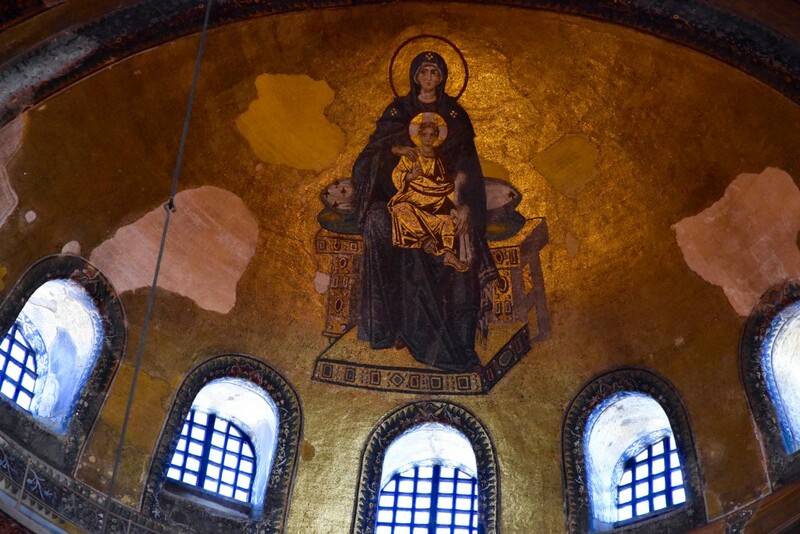 However, Justinian’s (and his wife’s Theodora, a former courtesan) most recognizable contribution was the construction of Hagia Sophia, the great Church of Constantinople. From 565 to 1025, a succession of warrior emperors kept invaders such as the Persians and the Avars at bay. Though the foreign armies often managed to get as far as Chalcedon (the present-day suburb of Istanbul), none were able to breach Theodosius’ land walls. In 1071 Emperor Romanus IV Diogenes (rule 1068-1071) led his army to eastern Anatolia (the ancient term for the territory of the modern Turkey) to battle with the Seljuk Turks, who had been forced out of Central Asia by the encroaching Mongols. The Byzantines were disastrously defeated and Seljuks won control of nearly all of Anatolia but left Constantinople to the Christians. From around the 9th to 13th centuries, Constantinople also developed complex relationships with an emerging and later the largest and most advanced state of that time in Europe – Kiev Rus. Many of the Kiev Princes were married to daughters of the Byzantine Emperors, and because of this connection Eastern Europe became Orthodox, after it was Christianized by Vladimir the Great of Kiev. That was the origin of my religion. As Turkish power was consolidated to the east, the power of Venice – always a maritime and commercial rival to Constantinople – grew in the West. From 1202-1204, the Fourth Crusade led by Enrico Dandolo, a blind Doge of Venice, attacked and sacked the Christian (!!!!) city of Constantinople, carrying off its wealth. With friends like these, the Byzantines hardly needed enemies! The crusaders chose Baldwin of Flanders to be their new Byzantine Emperor but a new Latin Empire at Constantinople lasted only until 1261, when the Byzantines under the command of Michael VIII Palaeologus recaptured the city and some outlying territory. After this, Constantinople never regained its former glory, partly because of its rulers’ political mistakes, and partly because of an upstart religion on their doorsteps: Islam. Rather than a thriving metropolis, it transformed into a collection of villages, and became a semi-ghost town with, as Ibn Battuta noted, “sown fields within the city walls”. After the Mongols trampled through Anatolia in 1243 ending Seljuk rule, the Turks formed small principalities, one of which was ruled by a warrior named Osman whose subjects took his name and called themselves Osmanli or Othmani (origin of the world “Ottoman”). Over the years, Osman’s principality grew in size and power, taking over Bursa as its capital and capturing Byzantine territories in Anatolia. By the mid-1400s, the Ottomans, under the rule of Mehmed II (rule 1451-1481) had grown strong enough to challenge Constantinople. Mehmed II became sultan at 12 years old when his father retired. Legend says that a military crisis soon broke out, and Mehmed II asked his father to lead the army one last time. When his father refused, the enraged Mehmed proclaimed, “If I am the sultan, I order thee to command the armies”… and, sure enough, his father returned to the throne. Upon his father’s death, Mehmed II resumed the power at the age of 19. Two years later, he laid siege to Constantinople. The Orthodox Byzantines looked for help in the Catholic West, but their pleas were in vain, due to the long-standing conflicts between these two branches of the divided Church. Giving up, the Byzantine clergy reportedly said, “We would rather be ruled by the Ottoman turban than by the Latin miter”. The siege lasted for almost two months, and even though Constantinople was the best-fortified city of its time, with the world’s strongest walls, it couldn’t resist a fairly new type of weaponry – the cannons. At last, Constantinople – and with it, Byzantine and Christian rule in the region – fell on May 29, 1453. The last Byzantine emperor, Constantine XI Palaiologos, died fighting on the walls of his city. Mehmed the Conqueror made Constantinople the new capital of his Islamic empire and “turk-ified” its name to “Konstantiniye”. Although Mehmed was a solder, he was also a man of intellect who spoke 6 languages fluently and appreciated art and science. The 21-year-old emperor at once began to rebuild and repopulate the city. Hagia Sophia was converted to a mosque, the city walls were repaired and a new fortress, Yedikule, was built. Greeks who had fled the city were encouraged to return and an imperial decree calling for resettlement was issued; Muslims, Jews and Christians all took up his offer and were promised the right to worship as they pleased. Mehmed II transformed the Ottoman state into a formidable empire, however it was one of his descendants, Suleiman the Magnificent (rule 1520-1566) who made it into a world power. Suleiman triggered an explosion of architecture (with the help of his master architect, Sinan) and expanded his territory as far west as Hungary and as far south as North Africa. (P.S. in my Malta blog I wrote about the Great Siege of Malta of 1565 led by Suleiman’s forces). Under Suleiman, 1/3 of Europe’s population lived within the borders of the Ottoman Empire, and Istanbul (a word originated from the Greek expression “istinpoli”, which means “to the city”) was the largest and most prosperous city in the world. By the 19th century, incompetent sultans, overtaxation, corruption and technological advances in the West eventually combined to bring down the mighty Ottomans. Nevertheless, Istanbul continued to be the “Paris of the East” and, to affirm this, the first great international luxury express train, the famous Orient Express, connected Istanbul and the French capital in 1883. The city’s slow decline reflected that of the sultanate. The concept of democracy, imported from the West, took off in the 19th century and the sultans were forced to make concessions towards it, by creating in 1876 the first Ottoman constitution and parliament (both of which were very short-lived). Siding with Germany during WWI didn’t help the Ottomans to regain lost territories in the Balkans and the Middle East, as they hoped, instead the war only hastened the empire’s demise and ultimately triggered, in 1923, the process of independence of not one but three nations: Australia, New Zealand and Turkish Republic. WWI also saw a controversial chapter in Turkish history. In 1915, the Ottoman government decided to forcefully relocate its Armenian population in the east, but as it turned out – all the way to the “better world”. Numbers differ but some 800,000 to 1,500,000 Armenians were killed, sacked, murdered, placed on boats and sunk in the Mediterranean. What became to be known as the first genocide in the history of human race, Armenian massacre has not been recognized by modern Turkish government (fantastic read “A Problem from Hell” by Samantha Powers). The post-WWI reforms by Mustafa Kemal (known as Ataturk “The Grand Turk”) were directed to propel Turkey into the 20th century and orient it towards the West rather than the East. State administration, education, lifestyle, dress, language – every aspect of Turkish life was affected. The new parliament abolished all of the old Ottoman institutions – the sultan was history, and the royal family was sent into exile. Constantinople was officially renamed Istanbul, but lost its capital-city status to Ankara, which was then a small town in the middle of the country. After Ataturk’s death in 1938, Turkey floundered as it searched for a leader and experimented with democracy. Ongoing political clashes resulted in multiple military interventions, and its current political system is based on the concept of strong administrative power, rather than collaboration and coalition. Istanbul is divided into the European part and Asian part by the north-south Bosphorus Strait; the most populated and touristic European part is also divided by the estuary of the Golden Horn into the old town to the south (Sultanahmet and Grand Bazaar Quarter) and the modern Istanbul to the north (Galata, Beyoğlu and Taksim). Sea of Marmara forms the natural southern boundaries of the city, while Black sea serves as the city’s northern limits. Most historic sights are located in the old town, while new town is a perfect place to get social, grab a dinner with friends or attend one of the hundreds of music venues. As I already mentioned, I happened to be in Istanbul simply because my morning flight from Malta to Minsk had a 24-hour lay-over in Turkey, so I decided to use this time to see the city. This is a guide to those who happened to be in Istanbul for a very short time, as it doesn’t cover most of the city’s sights but only the core ones. Turkish Airlines offer a free hotel accommodation for the flights with more than 12 hours of lay-over, but I decided not to take my chances and booked a very inexpensive Ares Hotel in Sultanahmet. At the airport, I negotiated a taxi ride to Sultanahmet (around $20, though my hotel offered a pick-up for $30) and off we went. The driver took me to the heart of the old town via Kennedy Caddesi, a coastal highway offering fantastic views of the Sea of Marmara to my right, and a long stretch of the thousand year old city walls to my left. The Ares hotel was perfectly located within a few mins walk to the Sultanahmet square, all modes of transportation, Blue Mosque and Hagia Sophia, etc. I only wish a bed in my room wasn’t round, but frankly, I barely spent any time in the room anyway. By the time I arrived to the hotel, Tanya and Nico were already waiting for me, so we started the exploration together. I have to admit, I read very little about Istanbul and since I came during the Muslim’s holy month of Ramadan (many mosques and sights have different schedules during the celebration), I had to completely rely on Nico and his knowledge of the city and local culture. I couldn’t have been more grateful to him for showing us Istanbul in the most efficient, speedy and glamorous way. Sultanahmet. I’ve got to see this part of the old town in two days, but to make it less confusing, I would go over the entire area at once. 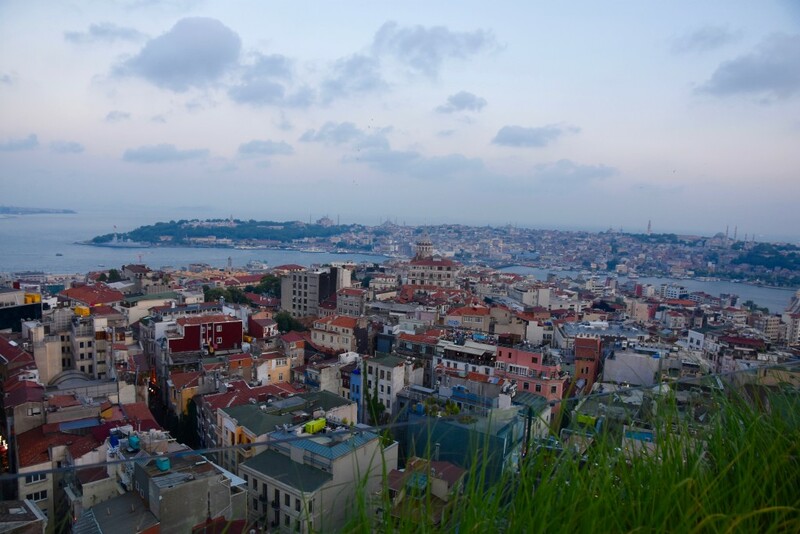 Just like Rome, Istanbul’s Old Town was built on seven hills. 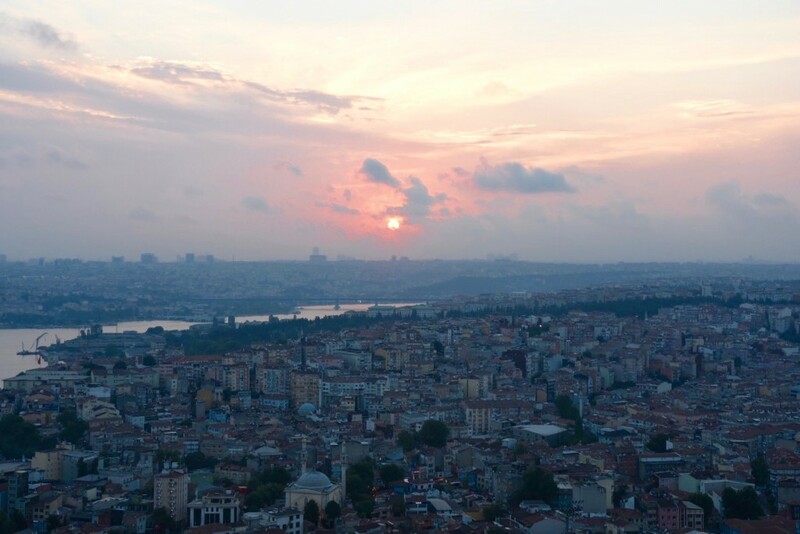 The district called Sultanahmet, on top of the first hill, is the historic core of the city. The Greek city of Byzantium was founded nearby, where Topkapi Palace stands today. Early Greek settlers – weary after their long journey – chose this highly strategic location, which could easily be fortified with walls on all sides. Today, Sultanahmet is Istanbul’s single best sightseeing area for visitors, playing host to Istanbul’s most important and impressive former church – Hagia Sophia, the Blue Mosque, one of the best museums of Turkish and Islamic Arts and city’s most significant Byzantine ruins – the Hippodrome and Underground cistern. Many visitors to Istanbul never make it out of the area which is hardly surprising, since not many cities have such a concentration of sights, shops, hotels and restaurants within easy walking distance. 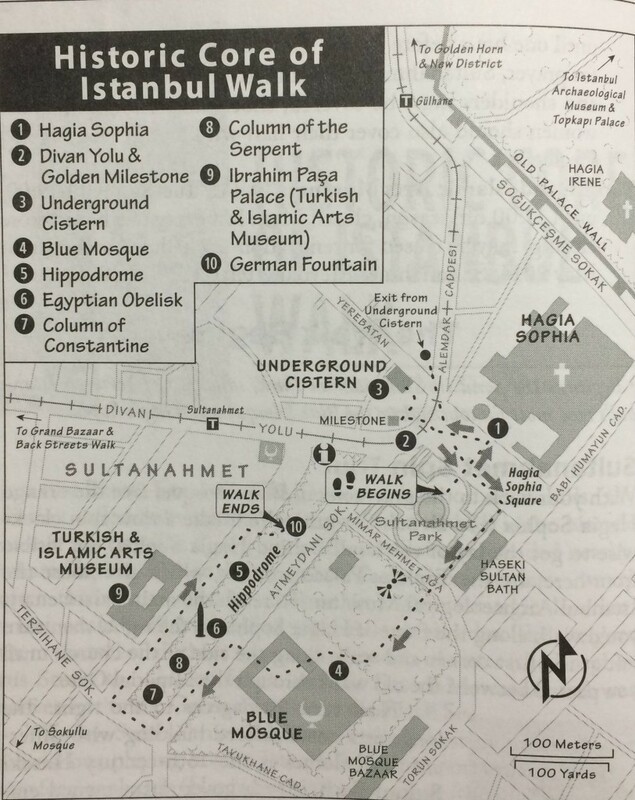 I use Rick Steves’ “Historic Core Of Istanbul Walk” as an exhibit, as it was exactly the walk we, unintentionally took. Please allow 5-6 hours. We started in the center of the Sultanahmet Park, which is a fine example of a city determined to be people-friendly and the best photo op for both Hagia Sophia and the Blue Mosque. Behind the orange Hagia Sophia are the Topkapi Palace grounds, which also house the Istanbul Archeological Museum (unfortunately, I didn’t make it there). If you turn 90° to the right – the long terracotta-colored building with different sized domes is the 16th century Haseki Sultan Bath, now a government – owned emporium. 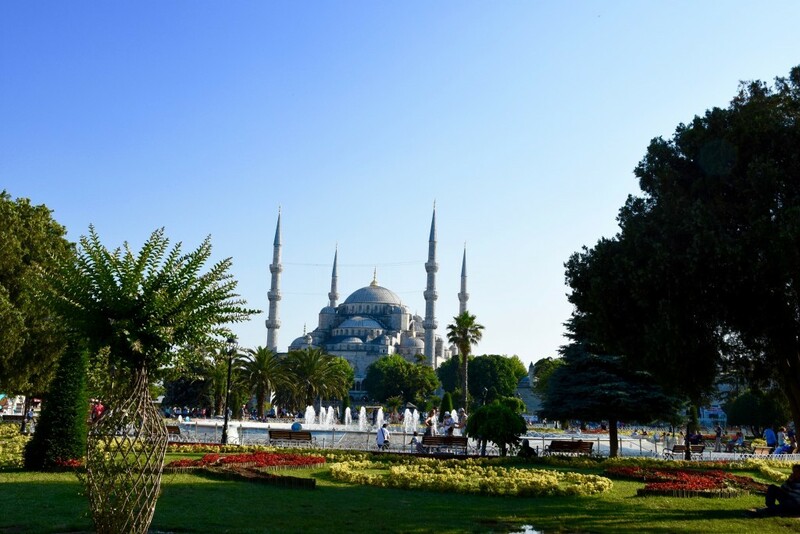 At the other end of the lively park is the famous Blue Mosque and just to its right (out of sight) is the long, narrow Byzantine square called the Hippodrome. The Sultanahmet Park was busy with tourists and men trying to sell you the boat tickets across the Bosphorus, but it turned into a real-time celebration at night, when Turkish people and visiting Muslims came here to eat and drink together. Hagia Sophia. There are many important monuments in Istanbul, but this venerable structure surpasses the rest due to its innovative architectural form, rich history, religious importance and extraordinary beauty. It was built on the site of Byzantium acropolis, over the remains of at least two earlier churches. 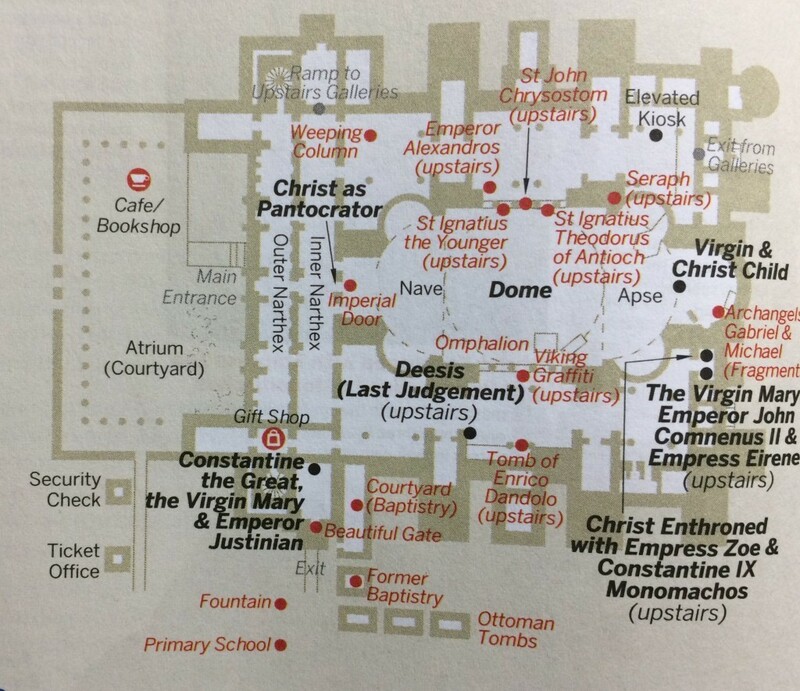 After the second of these churches was destroyed in the Nika riots in A.D. 532, Emperor Justinian I (rule 527 to 565) wasted no time, immediately putting his plan for Hagia Sophia (meaning “Divine Wisdom”) into action. He asked for the near-impossible: a church of an unbelievable grande proportions, a monument that would last for centuries and keep his name alive for future generations. Justinian appointed two geometricians to do the job: Anthemius, from the Aegean town of Tralles, and his assistant, Isidore of Miletus. Both of them knew that making Justinian’s vision a reality would be a risky project. More than 5,000 architects, stonemasons, bricklayers, plasterers, sculptors and mosaic artists worked around the clock for five years to complete Hagia Sophia – and drain the treasury faster than even the emperor had anticipated. In December of 537, the Great Church of Constantinople held its first service in the presence of Emperor Justinian and the Patriarch of Constantinople. The church was a huge success story for Justinian, who was understandably satisfied with his achievement. 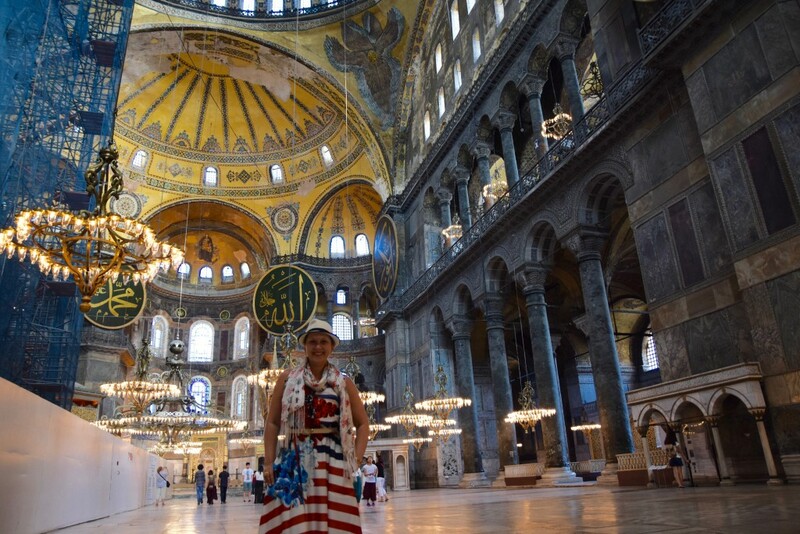 As the story goes, when he stepped inside the church, he exclaimed, “Solomon, I have surpassed you!” Hagia Sophia’s exterior might be visually underwhelming, but the interior with its magnificent domed roof soaring heavenward is simply sublime! In the long story of the empire, the Byzantines would never again construct such a grand edifice, but its design would influence architects for centuries. Even before Hagia Sophia was completed, it became legendary. People came from all over to watch the great dome slowly rise above the landscape of the city. It was the first thing that merchants saw from approaching ships and caravans. Hagia Sophia soon became a landmark and it continues to hold a special place in the mystical skyline of Istanbul. The structure served as a church for nearly a millennium. For a thousand years it stood as the greatest dome in the world, until the Renaissance, when Brunelleschi built his famous dome in Florence. 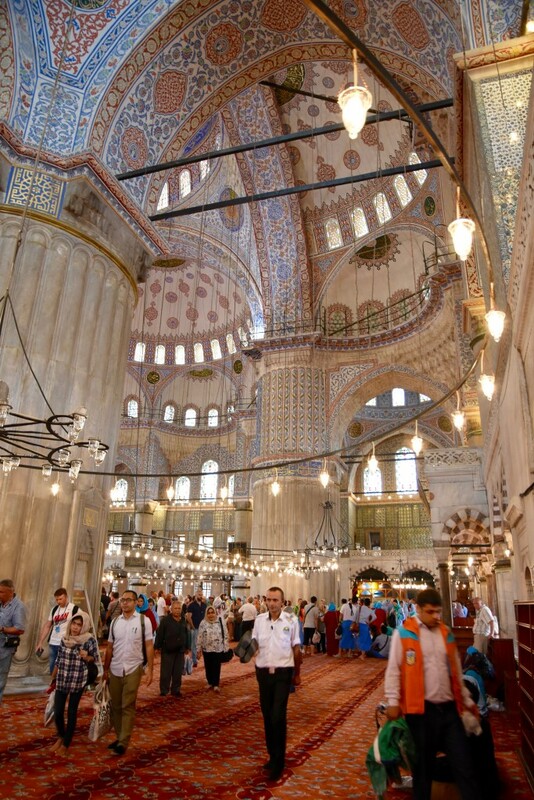 When the Ottomans took Constantinople in 1453, Sultan Mehmed the Conqueror, impressed with the Great Church’s beauty, converted it into an imperial mosque which remained such for five centuries. Of course, most of the functional elements that decorated the church were removed, and its figurative mosaics and frescoes were plastered over in accordance with Islamic custom. In the early years of the Turkish Republic (1935), Hagia Sophia was converted again, this time into a museum. 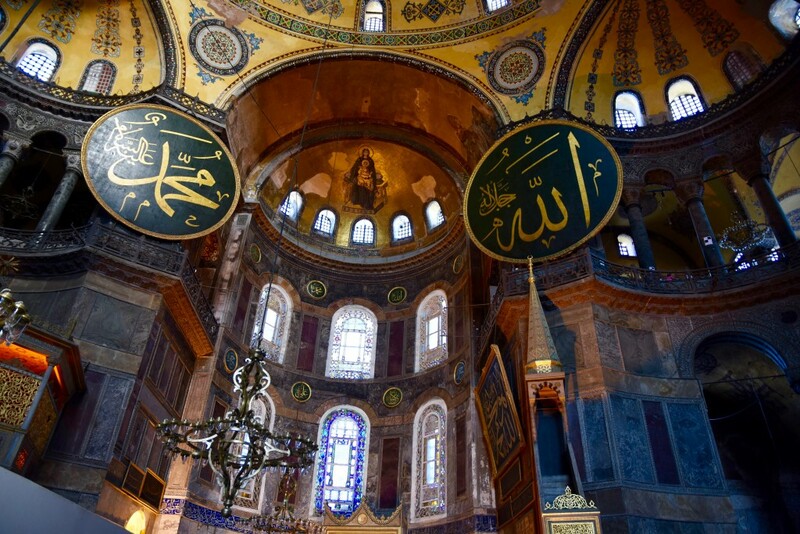 It is incredibly unique in preserving the elements of both the Byzantine and Ottoman empires and their respective religions, Orthodox Christianity and Islam. 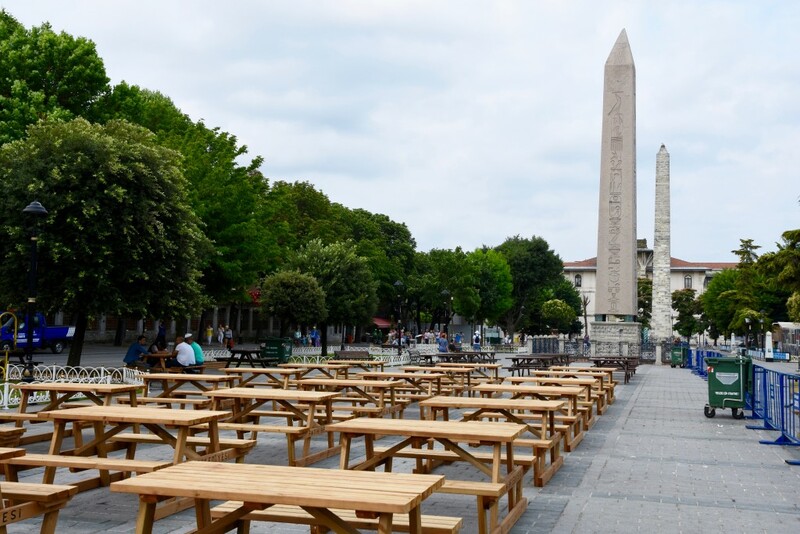 It, in a way, represents Istanbul itself – a blend of East and West. Tanya and I entered the building (30 TL ($11), allow 30-45 minutes) and walked into the Interior Narthex. It is an attractive space, with nice vaulted bays richly decorated with mosaics. The walls on either side are lined with thick marble-panels, which were glued to the wall with stucco and pinned with iron rods. On the narthex ceiling are original Justinian mosaic that served the Iconoclast Era because they were nonfigurative. The church designer, Anthemius, sought to give an impression of movement. There mosaic pieces – interspersed with randomly placed bits of semiprecious stones – change from muted shades to brilliant reflection, depending on the direction of the light. You can’t miss the Imperial Door, which was reserved for the emperor and opened only for him. Notice the metal hooks attached to the top of the doorway. The Ottomans added these to hold leather curtains, similar to those used in today’s mosques, to protect worshippers from dust and to reduce the interruption of a giant door opening and closing. 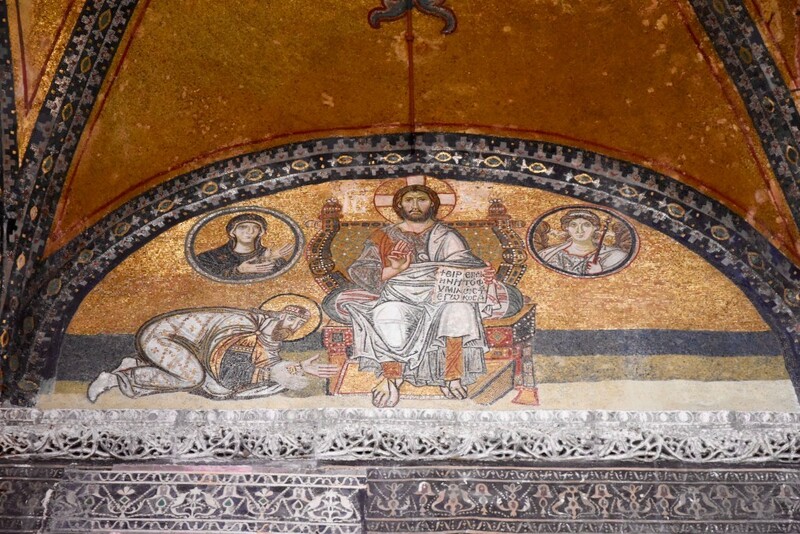 The gate is crowned with a striking mosaic of Christ as Pantocrator (Ruler of All), dating to 886-912. Christ holds a book that carries the inscription “Peace be With You. I am the Light of the World”. At his feet is an emperor, probably Leo VI, known as “Leo the Wise”. He is remembered more for his multiple marriages than for his intellect. His first 3 wives died without giving him a child, so he married Zoe Carbonospina, his mistress and the mother of his son. This sparkled a scandal: the emperor was excommunicated by the patriarch and barred from attending the Christmas service in 906. In this scene, Leo seems to be asking for forgiveness. The Virgin Mary is on Christ’s left and to his right is the Archangel Gabriel. Whitewashed over by the Ottomans, the mosaic was only rediscovered in 1933. Through the Imperial Door is the building’s main space, famous for its dome, huge nave and gold mosaics. Unfortunately, a huge scaffolding tower covered half of the interior, nevertheless, we were overwhelmed by the opulence of it. Almost never in your life, you get to experience the glory of the Byzantine Empire first hand, so take a minute and breath in. The main dome, 55.6 m high and 31 m in diameter, appears to float on four giant arches (the secret is the clear glass windows at the base of the dome). Over 100 columns provide further support to the upper parts of the building, many of which were re-used from even more ancient monuments and temples. As we looked around, we noticed the basic principle of Byzantine architecture: symmetry. All the architectural elements, including decorative pieces, are placed in a symmetrical fashion. The artful use of light creates the interior’s stunning effect. The windows at the base of the dome used clear glass, while other windows throughout the building used thin alabaster to further diffuse the light and form a more dramatic effect. 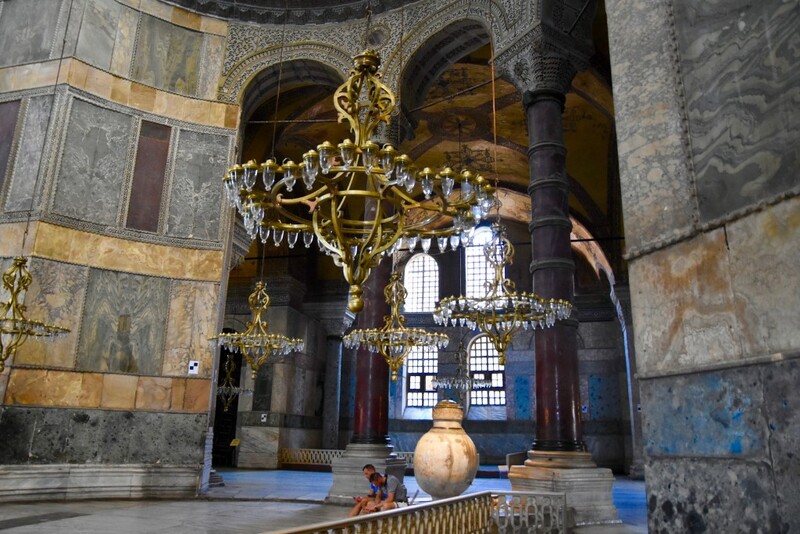 During the centuries that Hagia Sophia was used as a mosque, many of its original decorations, especially mosaics and frescoes depicting people, were covered over with whitewash and plaster. Ironically, in some cases, the plaster actually helped to preserve the artwork. For others, damage was inevitable, as the stucco absorbed the whitewash. 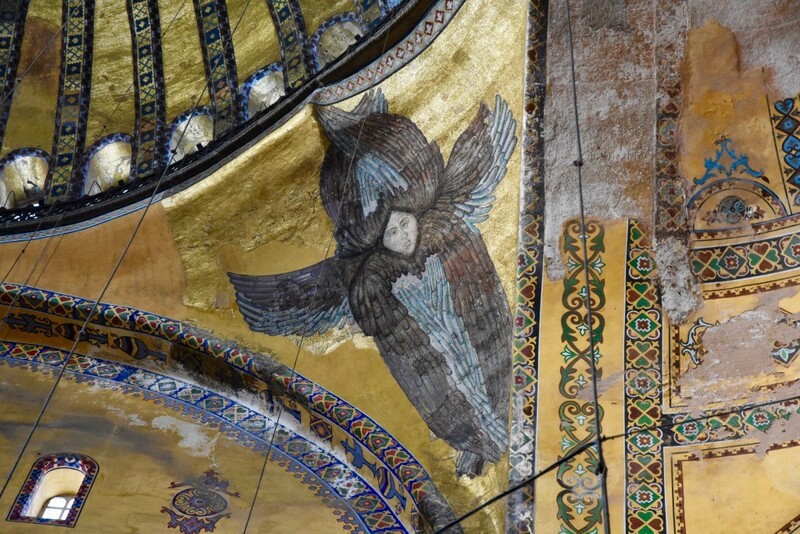 At the base of the dome, between intersecting arches, are winged seraphim. Gold-leaf masks or medallions cover these angels faces. The two nearest the Apse are from the 14th century (the masks on the one was removed in 2010), the other two are replicas by the Fossati brothers. The Ottoman additions that immediately drew our attention were Arabic calligraphy, especially the eight 7-m-wide medallions suspended at the bases of the arches supporting the central and side domes. These huge, leather-wrapped wooden medallions were added in the 19th century and decorated by master Islamic calligraphers. In a church, we usually see paintings of Biblical figures and saints, while in mosques (since Islam doesn’t allow depiction of people), it is common to see ornately written names of leading Muslim figures. The two medallions on the arches flanking the apse are painted with the names of Allah (on the right) and Muhammad (on the left). The four at the center name are four califs, Muslim religious and social leaders who succeeded the Prophet Muhammad: Abu Bakr, Umar, Uthman and Ali. 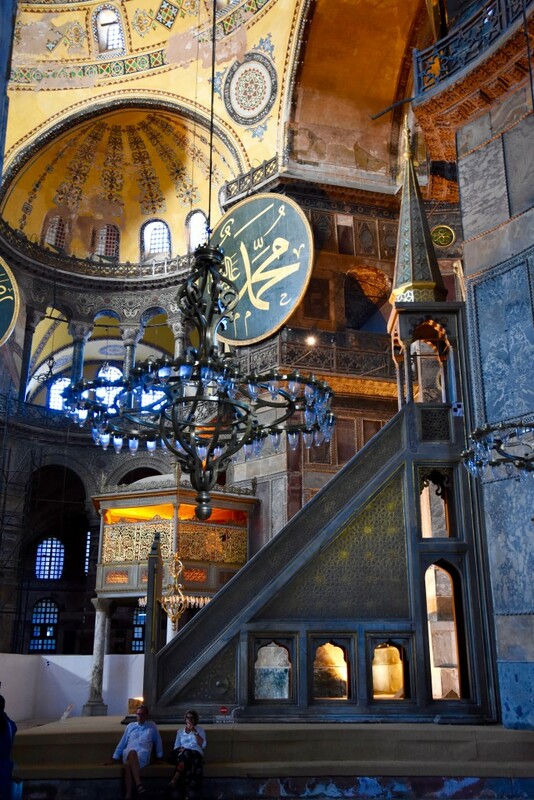 We walked toward the front of Hagia Sophia admiring the heavy chandeliers hanging from the dome (additions from Ottoman times), till we reached a highly decorated staircase – mimber. The mimber is the pulpit in a mosque, used by the imam to deliver his sermon on Fridays or to talk to the public on special occasion. The imam usually stands halfway up the stairs as a sign of respect, reserving the uppermost step for the Prophet. 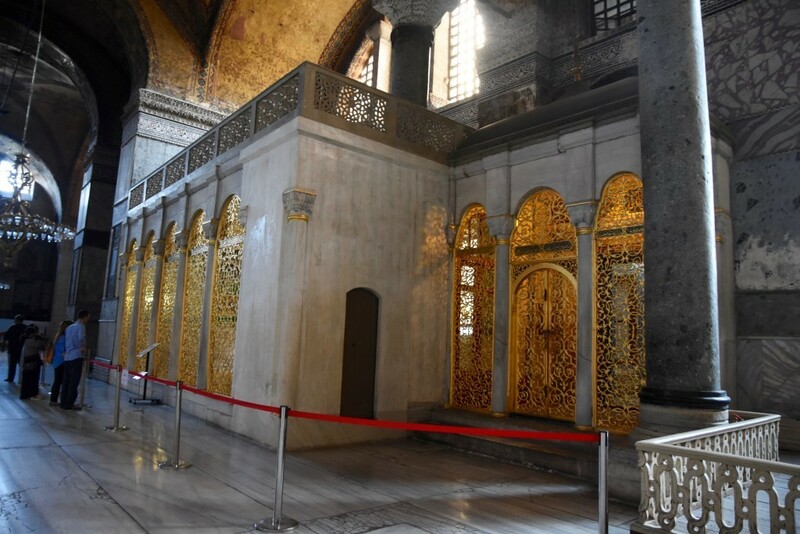 When Hagia Sophia (the original church, facing Jerusalem) was converted into a mosque, a small off-center niche was added in the apse’s circular wall. Called the mihrab, this niche shows the precise direction to face during prayers – Mecca. The stately columns flanking the mihrab are actually huge candles. High above the mihrab, on the underside of the semi-dome, is a colorful Mosaic of Mary and the Christ Child on a gold background. Christ is also dressed in gold. Part of the background is missing, but most of the scene is intact. This mosaic, the oldest one in Hagia Sophia dates from the 9th century. It may have been the first figurative mosaic added after the Iconoclast Era, replacing a cross-design mosaic from the earlier period. The gold “clubs” on Mary’s forehead and both shoulders stand for the Trinity. There are also the red “spades” among the “clubs” on the pillow. On the right end of the arch, just before the semi-dome, there is the Mosaic of Archangel Gabriel with his wings sweeping down to the ground. On the opposite end of the arch, there was a similar mosaic of Archangel Michael. To our left, by the side of the apse (the frilly gilded room under the big medallion), is the elevated prayer section for the sultan, or the sultan’s loge, which was added in the 19th century. 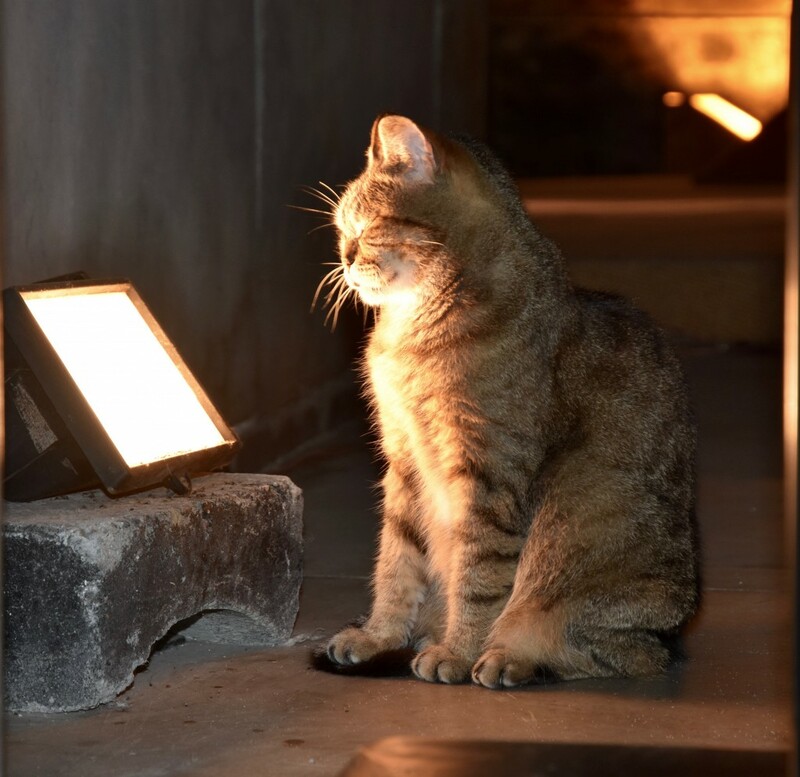 I walked behind the mimber and was pleasantly surprised by a presence of a cat, who was carelessly sunbathing next to a lamp. The patterned marble omphalion marks the spot where the Byzantine emperors were crowned while seated in a throne placed in this section of inlaid marble in the main floor. Nearby, in the south isle, is the library of Mahmut I which was built in 1739. In the far corner, you can’t miss a huge alabaster urn, one of two Hellenistic-era urns (2nd century B.C.) that the sultan brought to Istanbul from Pergamon. 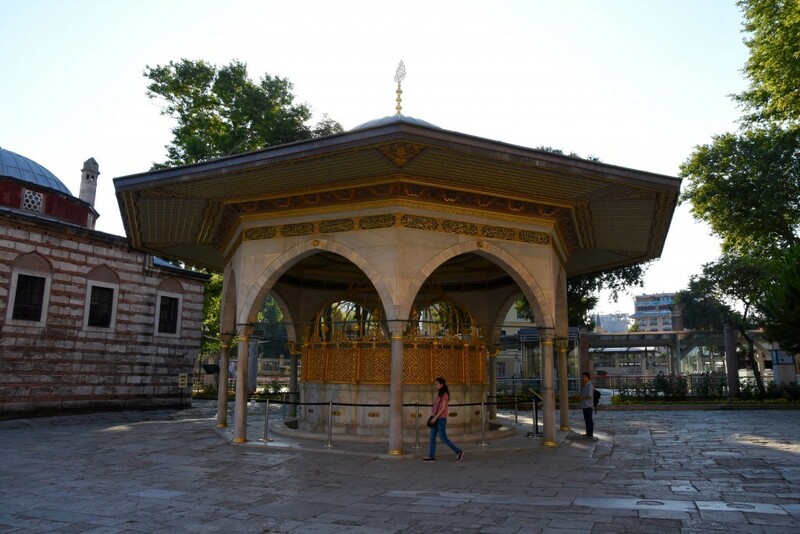 Look for a tap, mounted in the side, as traditionally, Ottoman mosques had functional fountains inside to provide drinking water for worshippers. The two purple porphyry columns behind each urn are older than Hagia Sophia. Unfortunately, we missed the famous weeping column, known to be blessed by St. Gregory the Miracle Worker. They say that if you put your finger into the hole and it emerges moist, your prayer will be answered. We also unforgivingly missed the upper galleries, containing the remnants of a magnificent Deesis (Last Judgement), mosaic of the Virgin and Child with Emperor John Comnenus and Empress Irine, the 11th century mosaic of Christ with Emperor Constantine IX Monomachus and Empress Zoe, a spot where the empress’ throne was placed and of course, the Tomb of Enrico Dandolo. Once you find his tomb, spit on it for bringing the Byzantine empire to its collapse. We exited via the Vestibule of Guards, named so for the imperial guards who waited here for the emperor while he was attending church services. Byzantine emperors used this entryway because of its proximity to the royal palace, which stood where the Blue Mosque is today. 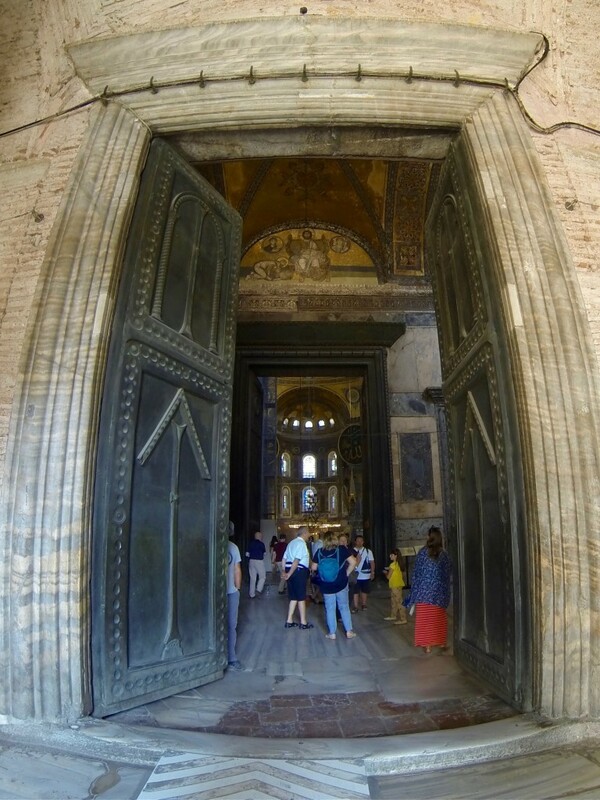 Scholars believe that the entrance’s imposing bronze doors were brought here from an ancient temple in Antioch sometime after Justinian’s reign. At the top of the flat panel, there are traces of the silver imperial monograms that were once affixed to the bronze sheeting. 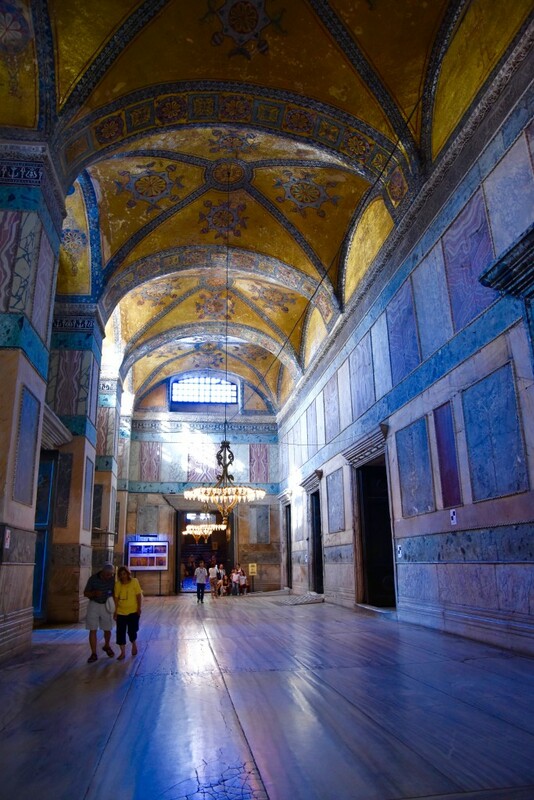 The vaulted ceiling is covered with original mosaic, dating back nearly 1,500 years to Justinian’s time. Above the doorway is a gorgeous 10th century mosaic of Constantine the Great, the Virgin Mary and Emperor Justinian. 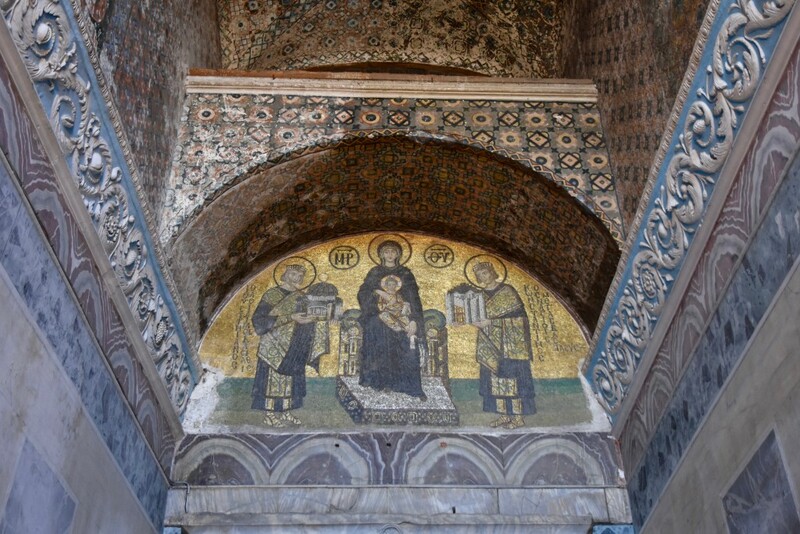 The mosaic dates from the reign of Basil II and scenes such as this became common in later Orthodox churches (which we’ve seen plenty in Greek Meteora), depicting the patron who funded the church’s construction and to whom the church is dedicated. In the mosaic, Mary and the Christ child sit enthroned, with Jesus holding the Gospels with his left hand while making the three-fingered sign of the Trinity with his right hand. The mighty Roman emperors flank the Holy family. On the right, Constantine presents Mary and Christ with a model of his city, Constantinople. On the left is Justinian, presenting a model of his greatest achievement, Hagia Sophia. Closer look reveals the “real” Hagia Sophia – with no minarets, retaining or garden walls and with its dome topped with a cross. It is very fortunate that this mosaic has survived so beautifully intact. The doorway to the left leads into a small courtyard that was once part of a 6th century Baptistry. In the 17th century it was converted into a tomb for Sultans Mustafa I and Ibrahim I. In the courtyard, you can’t miss the 18th century fountain and water taps in the portico by the side of the main building. Both of these were used for ablution (ritual cleansing before prayer) as part of Islamic tradition when Hagia Sophia was a mosque. We turned right as we exited Hagia Sophia and appeared on the busy street with the trams, called Divan Yolu, which is a main thoroughfare through Sultanahmet. To the left (uphill), it leads to the Grand Bazaar and to the right (downhill), it heads to the Galata Bridge and New District. Divan Yolu was also Constantinople’s main transportation artery in Byzantine times, when it was called Mese (“Middle way”). It was a 25 m wide, marble-covered road adorned with marble pillars and cloisters of the buildings that flaunted stores on the ground floor and sculptures on the upper floors. The road started right here, where the Golden Milestone (Miliarium Aureum) still stands. Some 1,500 years ago, the Byzantines considered this point the center of the world. This ancient and once gilded milestone showed the distance to key locations within the empire, today it’s a mere stub worn down by the centuries. Nothing remains of its decorative arches or of the statues that once adorned it – of Constantine and his mother, Helen, holding a cross. Next to the Golden Milestone there is an entrance to the Underground Cistern. You can’t miss it as a huge line will surely indicate that it is an important sight to visit. 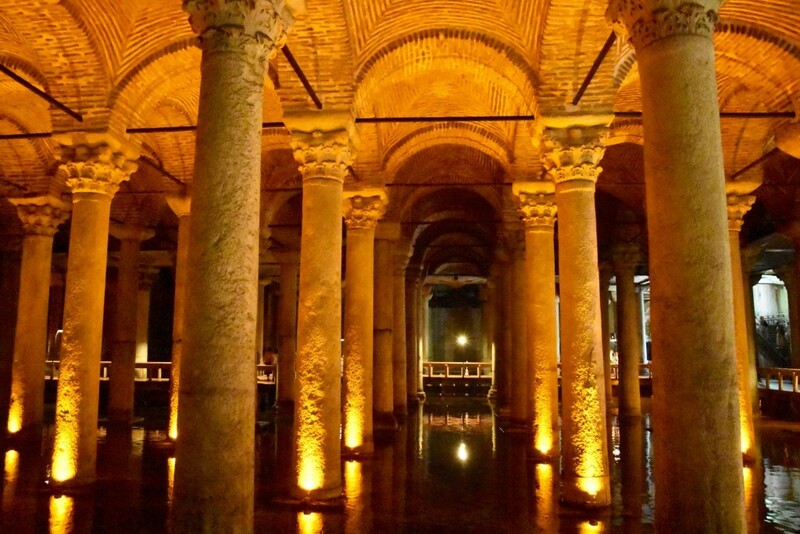 This vast reservoir dates back to Byzantine Emperor Justinian’s reign in the 6th century A.D. Because it was built on the site of an earlier Stoa Basilica, it’s often called the “Basilica Cistern”, however most Turks (including taxi drivers) know is as Yerebatan Sarayi, which means “sunken palace”. My special interest to this place was instigated by Dan Brown‘s latest book “Inferno”, those who read it, know exactly what I mean (to tell the truth, the Cistern was the first place I visited in Istanbul, this is just how eager I was to see this place with my own eyes). The Byzantine Empire enjoyed a Golden Age under Emperor Justinian, its enormous wealth can still be seen in the monuments and even the functional buildings (such as other cisterns) of that era. This massive reservoir, larger by far than any other in Constantinople, was built in 532 to meet the needs of a fast-growing capital city and to provide precious water in case of a shortage. Designed to service the Great Palace and surrounding buildings, it covers the size of two football fields (138 m by 65 m) and is able to store up to 80,000 m³ water delivered via 20 km of aqueducts from a reservoir near the Black Sea. As the pipes of the aqueduct gradually became clogged and Byzantine emperors relocated from the Great Palace, the cistern fell out of use and people’s memory. It wasn’t rediscovered until 1545, when scholar Petrus Gyllius was researching Byzantine antiquities in the city and was told by local residents that they were able to obtain water just by lowering buckets into any garden well (or even space below their basement floors), some could even catch fish that way. Intrigued, Gyllius explored the cistern by accessing it through one of the basements, however, even after his discovery, the Ottomans didn’t treat the so-called “Underground Palace” with respect it deserved – it became a dumbing ground for all sorts of junk, as well as corpses. The cistern was cleaned and renovated in 1985 and open to the public in 1987. This beautiful piece of Byzantine engineering is now one of the city’s most popular tourist attractions. Ticket 20LT ($7), guide 20LT ($7), allow 20-30 minutes. Keep in mind that entrance and exit are two different doors. We descended into the cistern where wooden platforms allowed us to get to pretty much every corner. Only about two thirds of the original structure is visible today, the rest have been bricked up in the 19th century. While water once filled this space halfway to the ceiling, today it is just a shallow pond, formed from rainwater that leaks in through cracks and compromised mortar in the ceiling (accumulated water is usually pumped out to prevent damage). According to our guide, before the walkway was built, the water was six feet deep and the only way to see the cistern was to rent a boat and row in the dark. A forrest of 336 columns support the brick ceiling and most of those columns were recycled from earlier Roman ruins in and around the city (pay attention to the variety of capitals on top of the columns). The symmetry and sheer grandeur of conception are quite breathtaking. One of the columns is engraved with raised pictures of a Hen’s Eye, slanted branches, and tears. This column resembles the columns of the Triumphal Arch of Theodosius I from the 4th century (A.D. 379–395), erected in the ‘Forum Tauri’ Square. 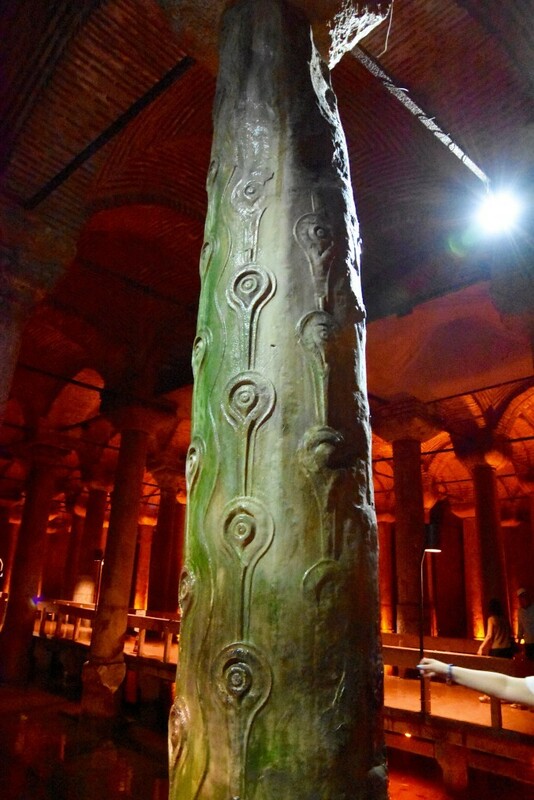 Ancient texts suggest that the tears on the column pay tribute to the hundreds of slaves who died during the construction of the Basilica Cistern. 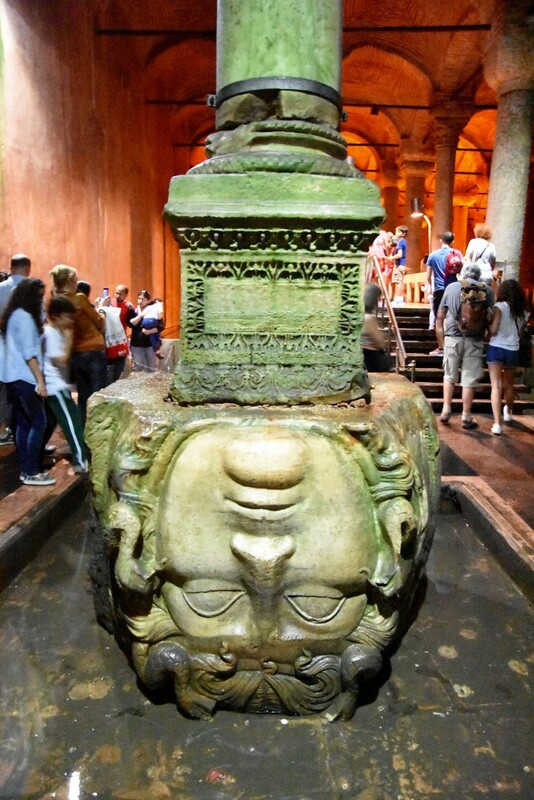 At the far left-hand corner of the cistern two columns rest on Medusa head bases – once sideways and one upside-down. The Greeks often carved this fearsome mythological gorgon, with hair made of snakes and a gaze that could turn people to stone, into tombstones or cemetery wall to scare off grave robbers. In Roman times, she became a protector of temples. When Christianity tool hold, Medusa was a reminder of the not-so-distant Roman persecution of Christians, so it may be no coincidence that these pagan fragments were left here in a dark corner of the cistern, never to see daylight again. Near the exit, there is a stage. Apparently, the cistern serves as an exhibition hall for the Istanbul Biennial art festival and is a concert venue from time to time, mainly for traditional Turkish or Sufi music. There is also a small cafe, full of underground ambiance. After the visit to the Cistern, we crossed Sultanahmet park and approached Istanbul’s most famous Blue Mosque (Sultan Ahmed Mosque), called so by its rich blue color of the handmade Iznik ceramic tiles that dominate the interior. Sultan Ahmed I set out to build a monument (1609-1616) that would rival and even surpass the nearby Hagia Sophia in grandeur and beauty and also to re-assert the Ottoman power (after a crashing loss in a war with Persia). While his predecessors had paid for their mosques with their spoil of war, Ahmed I had to remove the funds of the Treasury, because he had not gained remarkable victories. 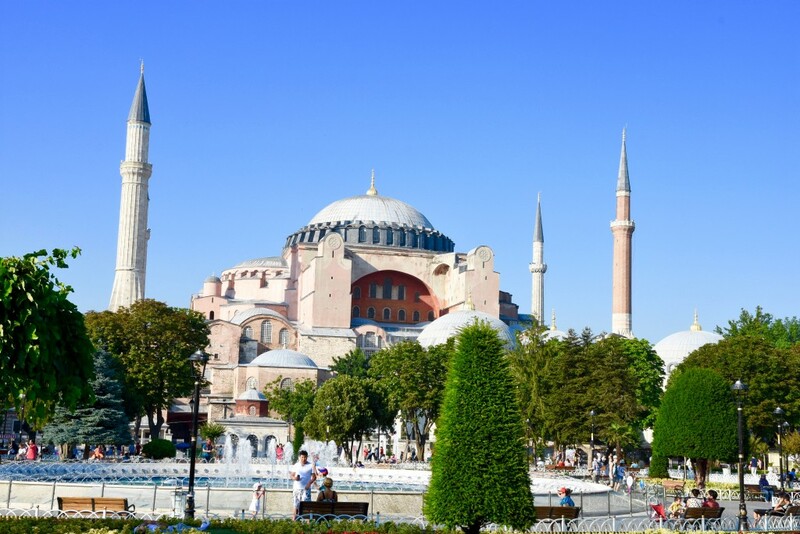 The mosque was built on the site of the palace of the Byzantine emperors, in front of the basilica Hagia Sophia (at that time, the primary imperial mosque in Istanbul) and the hippodrome, a site of significant symbolic meaning as it dominated the city skyline from the south. Big parts of the south shore of the mosque rest on the foundations and the vaults of the old Great Palace. The young sultan was so enthusiastic about the project that he is said to have worked with the laborers and craftsmen on site, pushing them along and rewarding extra effort. With the mosque’s exterior, the architect, Sedefkâr Mehmet Ağa, managed to orchestrate the visual effect that Hagia Sophia achieved with its interior. Aside from its impressive scale, the Blue Mosque is unique because of its six minarets. According to Muslim tradition, the imam or the muezzin (a man chosen for his talent in correctly voicing the call to prayer) would climb to the top of a minaret 5 times a day to announce the call to prayer. On hearing this warbling chant, Muslims are to come to the mosque to pray. A single minaret was adequate for its straightforward function, but mosques financed by sultans often wanted to show off with more. Story goes that Sultan Ahmed I asked the architect for a gold (altin) minaret, but the man thought he said “six” (alti). In all likelihood, Ahmed probably requested the six minarets to flaunt his wealth. Important to notice, that at the time only the central mosque in the holy city of Mecca had six minarets. The clergy at Mecca feared that Ahmed’s new mosque would upstage theirs, so they ordered to add one more in Mecca. We proceeded ahead (special free entrance for tourists, make sure to wear appropriate attire – shoulders and legs must be covered, shoes off) via a staircase that led up to an inner courtyard. The courtyard is surrounded by portico, which provides shade and shelter. In the center, there is a fancy fountain, once used for ablutions but no longer functional. When the mosque fills up for special services, worshippers who can’t fit inside, pray in the large vaulted area in front of the mosque (to the left) and if necessary, fill the rest of the courtyard. Our visit coincided with Ramadan, but the courtyard (and the mosque) had very few followers, mostly tourists. Stepping through the heavy leather drape into the interior, it becomes clear why it is called the Blue Mosque, it also feels like the largest indoor space in the world. A wooden railing separates the “praying” side of the mosque from the “tourist” side. On the far wall, a highly decorated niche with large candles on either side is mihrab, while the surrounding wall is decorated with Venetian floral-designed stained-glass window, many of which are original. On the right side of the apse is a staircase leading up to a platform with a cone on top. It is the mimer, similar to a pulpit in a Christian church. Further to the right, next to the main pillar, is an elegant marble platform elevated on columns. This is where the choir sings hymns a cappella (mainstream Islam doesn’t use musical instruments) on important religious days. Mosque services are segregated: the main hall is reserved for men, while women use the colonnaded area behind the barrier at the back, on both sides of the main entrance or the upper galleries. The huge dome, reaching a height of 43 m and a diameter of 33.5 m, is modeled after the one in Hagia Sophia, which was the first building to use pillars to support a giant central dome. As Turkish engineers improved on this concept over the years, they were able to create colossal indoor spaces covered by cascading domes. Near the corners of the vast room, there are giant pillars paved with fluted marble panels. These “elephant feet” support the arches, dome, semi-domes and cupolas. Since the weight is transferred mainly to these 4 pillars, think, bulky walls aren’t necessary. This technique allowed the architect to fill the walls with 260 decorative windows, enhancing the mosque’s interior. The low-hanging chandeliers were designed for oil lamps with floating wicks; they were designed to be raised and lowered to tend to the lamps (although now, they hold electrical bulbs). Years ago, handmade rugs covered the floor, but they were replaced with the current machine-made carpeting, decorated with line-like design to organized the worshippers. Islamic tradition forbids the portrayal of living beings in places of worship, since it could distract people from praying to Allah as the one God. As a result, the Muslim world excelled at nonfigurative art, mostly geometric designs and calligraphy. Along with painted floral and geometric patterns, more than 20,000 ceramic tiles were used extensively to decorate the mosque. Lower parts of the wall, up to the height of the marble application on the giant pillars, are paved with mostly blue, early 17th century Iznik tiles. As for calligraphy, to make the words appear more beautiful, calligraphers (hattat) took liberties with grammatical rules and often combined letters irregularly, making it esthetically beautiful but difficult to read. Many examples of calligraphy around the mosque are excerpts from the Quran or from the hadith (the collected teachings of the Prophet). The two medallions high above the mihrab read “Muhammad” on the left and “Allah” on the right. The Blue Mosque represents the pinnacle of Ottoman architecture and marks the beginning of the empire’s decline. After its construction, the treasury was exhausted, and the Empire entered a period of stagnation that eventually led to its collapse. Never again could the empire afford a building of such magnitude and splendor. Before we exited, we went back to the inner courtyard and sat on the marble steps facing the mosque. There were no better views of the flowing domes of the Blue Mosque but from that spot. As we stepped outside the exterior gate, we entered a long, rectangular square that was the ancient Hippodrome of Constantinople. The first Hippodrome was built when the city was a small provincial town Byzantium. In A.D. 203 the Emperor Septimius Severus rebuilt the city and expanded its walls, endowing it with a hippodrome, an arena for chariot races and other entertainment. In A.D. 324 when the Emperor Constantine decided to move the capital of the Roman Empire to Constantinople, he greatly enlarged the city. One of his major undertakings was the renovation of the Hippodrome and it is estimated that the Hippodrome of Constantine was about 450 m long, 130 m wide, and was capable of holding 100,000 spectators. It was Constantinople’s primary venue for chariot races, but it also served as a meeting place for the city people and a scene of social and religious disputes, political clashes and violet uprisings. The courtyard of the Blue Mosque marks the former site of the Hippodrome’s kathisma (royal lodge). Supported by gorgeous marble columns, this grandstand was where the emperor and his family watched the races unfold. The lodge was connected to the Great Palace for an easy escape in case the crowd got out of control (which happened a lot). The Hippodrome Boxes, which had four statues of horses in gilded copper on top, stood at the northern end; and the Sphendone (curved tribune of the U-shaped structure, the lower part of which still survives) stood at the southern end. These four gilded horses, now called the Horses of Saint Mark, whose exact Greek or Roman ancestry has never been determined, were looted during the Fourth Crusade in 1204 and installed on the façade of St Mark’s Basilica in Venice. The track was lined with other bronze statues of famous horses and chariot drivers, none of which survive. The hippodrome was filled with statues of gods, emperors and heroes, among them some famous works, such as a Heracles by Lysippos, Romulus and Remus with their she-wolf and the Serpent Column of the Plataean tripod. When races went out of vogue, the once-proud structure became a makeshift quarry for builders scavenging pre-cut stones. It was in ruins long before the Turks arrived; they named it Atmeydani (“horse-track”) and used it for horseback riding and archery training. Through the years, dirt dug up to make way for the foundations of surrounding buildings was dumped here, so today’s ground level is significantly higher than during Byzantine times (you can see the original level by looking at the base of the monuments still standing there). The last remaining stones of the Hippodrome’s seats were used to build the Blue Mosque. However, a few original monuments still remain on the Hippodrome. Among these is the Tripod of Plataea, now known as the Serpent Column, cast to celebrate the victory of the Greeks over the Persians during the Persian Wars in the 5th century B.C. Constantine ordered the Tripod to be moved from the Temple of Apollo at Delphi (where it stood for 800 years), and set in middle of the Hippodrome. The names of the sponsoring cities were inscribed at the base (currently underground, buried by earth accumulated over the centuries) and the top was adorned with a golden bowl supported by three serpent heads. The bowl was destroyed or stolen during the Fourth Crusade and the serpent heads were destroyed as late as the end of the 17th century (though, the upper jaw of one snake was recovered and is displayed at the Istanbul Archaeology Museum). All that remains of the Delphi Tripod today is the base, known as the “Serpentine Column”. Another emperor to adorn the Hippodrome was Theodosius the Great, who in 390 brought an Egyptian Obelisk and erected it inside the racing track. Carved from pink granite, it originally stood at the Temple of Karnak in Luxor during the reign of Thutmose III in about 1490 B.C. to commemorate the Pharaoh’s military achievements. 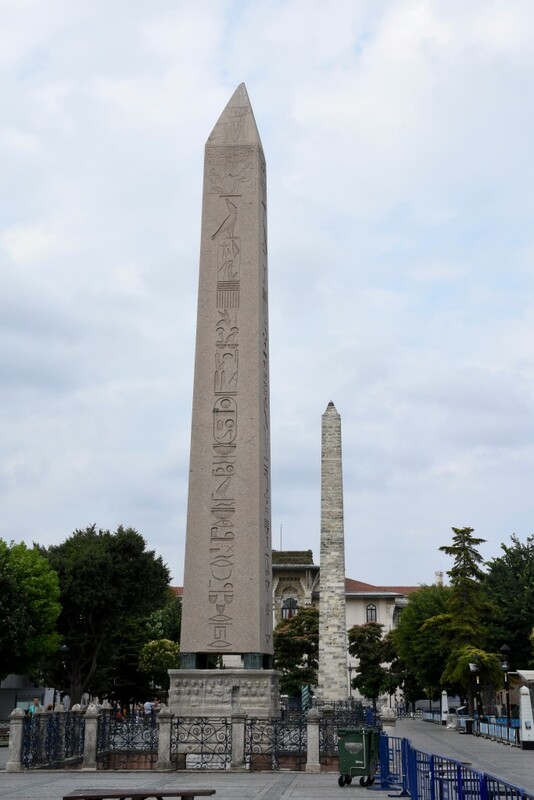 Theodosius had the obelisk cut into three pieces and brought to Constantinople. The top section survived, and it stands today where Theodosius placed it, on a marble pedestal. The obelisk has survived nearly 3,500 years in astonishingly good condition. The most interesting part of the Obelisk is its Byzantine base, which was cut out of local white marble and stands on four bronze feet. Relief on all four sides of the base depict Emperor Theodosius the Great and his family at the royal lodge, watching the Hippodrome races. On the side facing the Blue Mosque, the emperor gives an olive wreath to the winner, while his servant hands our a sack of coins. On the opposite side, envoys bow down before Theodosius in homage. At the bottom of the base (facing Hagia Sophia), there is the relief showing the column as it lay horizontal, and how pulleys were used to raise it. 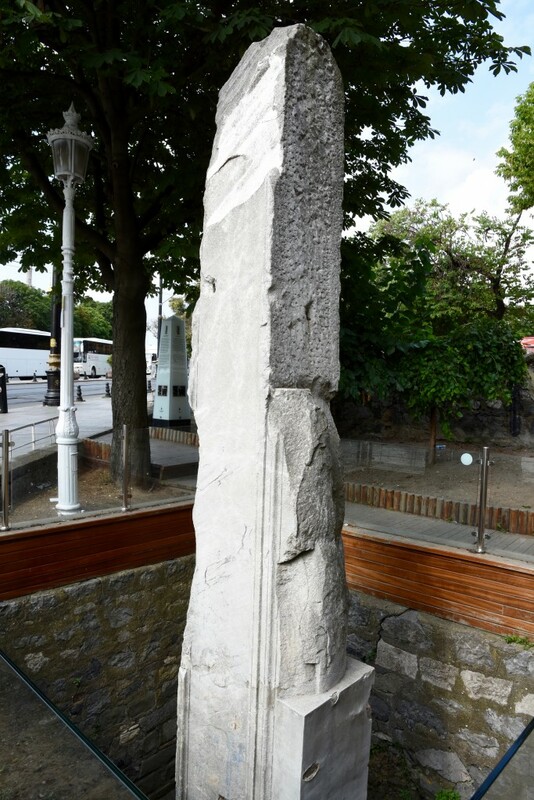 In the 10th century the Emperor Constantine Porphyrogenitus built another obelisk at the other end of the Hippodrome. It was originally covered with gilded bronze plaques, but they were sacked by Latin troops in the Fourth Crusade. The stone core of this monument also survives, known as the Walled Obelisk. During Ramadan, the area was filled with benches and tables so at sunset, Muslims could break their fast here. At the northern end of the Hippodrome, the little gazebo with beautiful stone work is known as Kaiser Wilhelm’s Fountain (or German Fountain). 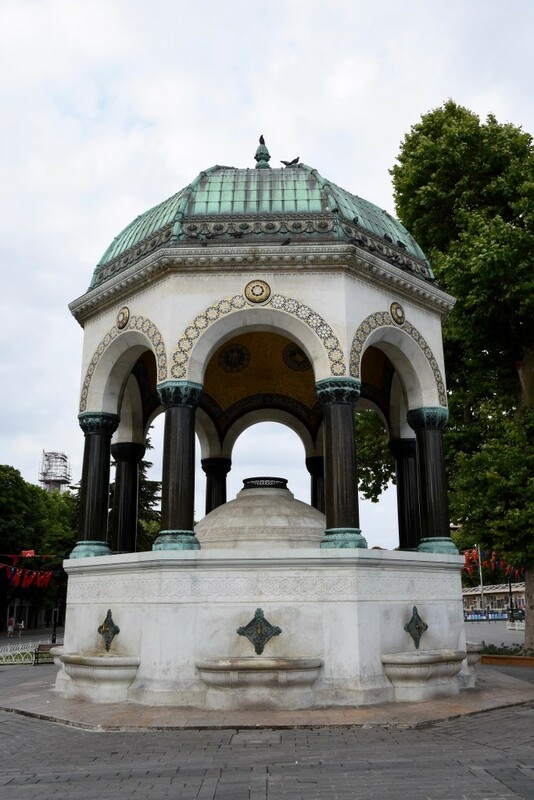 The fountain was a gift from the German government to commemorate Kaiser Wilhelm II’s visit to Istanbul in 1898. It was constructed in pieces in Germany, then shipped to Istanbul in 1901 and reassembled on this location. Kaiser Wilhelm II visited Istanbul 3 times to schmooze the sultan Abdulhammit II. By the early 20th century, it was obvious that a war between the great powers of Europe was imminent and empires were choosing sides. Though the Ottoman Empire was in its waning days, it remained a formidable power in the east and a valuable ally for Germany. Sure enough, when WWI erupted in 1914, the Ottomans joined the fray as Germany’s ally. Less than 4 years later, they lost the war and with it, what remained of their ailing empire. It was getting late and we still wanted to fit one more place before dropping somewhere for pre-sunset drinks. So, we all jumped into Nico’s car and …. got lost in the winding streets of old Istanbul. It must have been a whole-sale area of the city as we passed multiple stores, piles of shoe-boxes, discarded leather and other manufacturing waste. A true face of a merchant city! The Suleymaniye Mosque crowns one of Istanbul’s seven hills and dominates the Golden Horn, providing a landmark for the entire city. 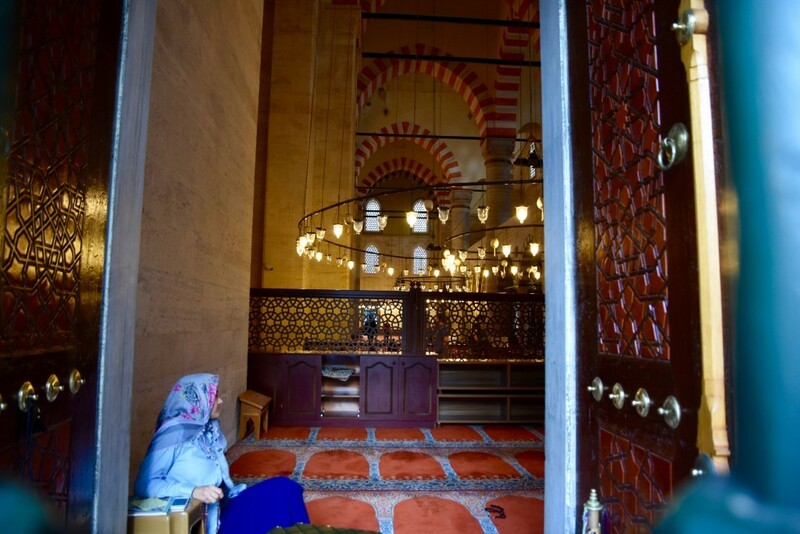 Though it is not the largest of the Ottoman mosques, it is certainly one of the grandest and it is unusual in that many of its original kulliye (mosque complex) buildings have been retained and adapted for reuse. 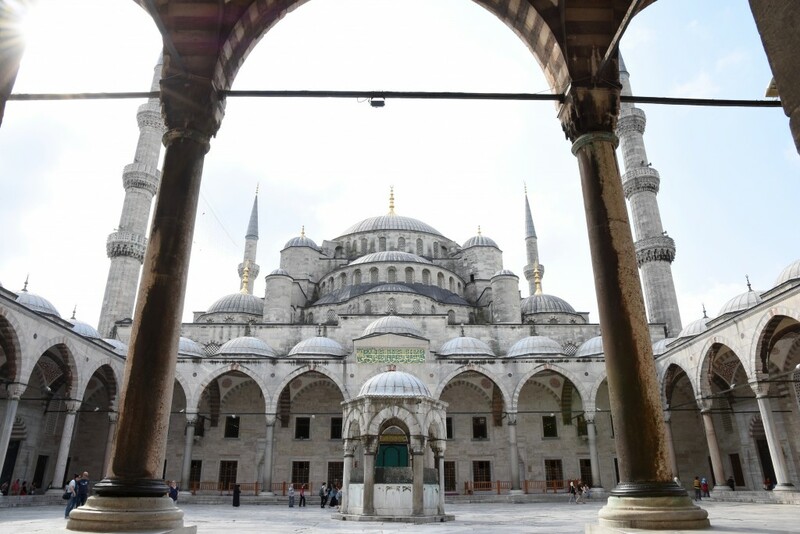 Built for the Sultan Suleiman the Magnificent by his prolific architect, Sinan, and completed in 1557, the Mosque of Suleyman the Magnificent almost outdoes the Blue Mosque in its sheer size, architecture and design. 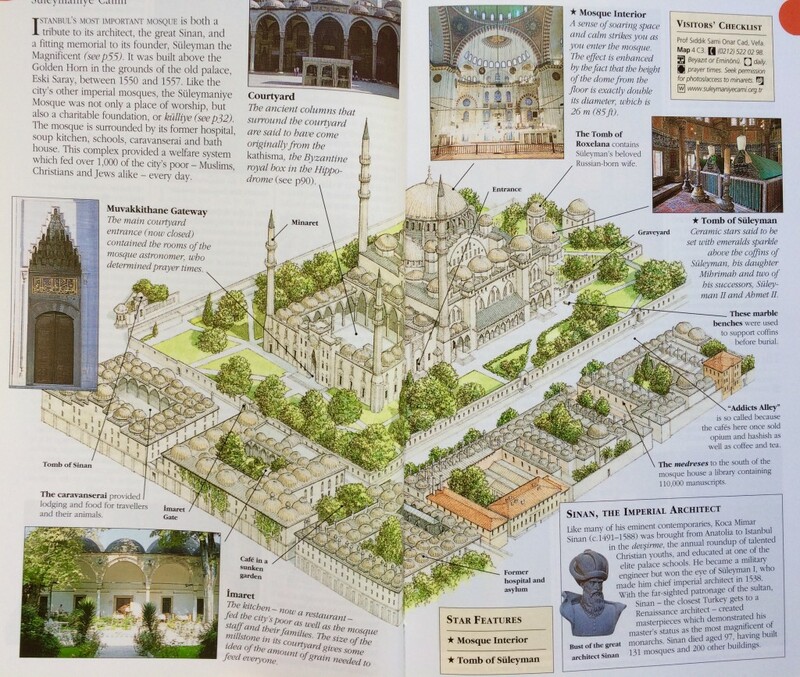 The term “Suleymaniye” applies not just to the mosque, but to the huge network of related buildings that nestle around, including the ornate mausoleums of Suleiman and his wife, a former Ukrainian slave girl – Sultana Roxelana, as well as former madrassa, caravanserai, public kitchen for poor, etc. In 2015, the mosque was almost as clean and shiny as it was the day it opened, thanks for a recent renovation. The building facing the main square in front of the Mosque is the madrassa. Originally, this school of theology was divided into three sections: the first two were devoted to interpreting the Quran, while the third (at the far end with the flagpole at its entrance) was a medical school – now it is a hospital. Then we entered the courtyard and proceeded towards the gate leading into the cemetery. Just before the cemetery, take a look to your left to see two elevated stone slabs – these are used to support the coffin during a funeral service. According to Muslim tradition, the body of the deceased is washed and wrapped in a white shroud, then placed in a wood coffin and brought to stone slabs such as these. Relatives and friends gather nearby, and the imam leads them in one last prayer for the soul of the deceased. The body is then taken into the cemetery and buried, still in the shroud but without the coffin. Just as a Muslim faces Mecca to pray, the body of a Muslim is buried so that it points eternally toward Mecca. As we walked through the cemetery, we notices that each tomb had two headstones, apparently, the larger one was inscribed with the epitaph, while the smaller one was for decoration. The first and bigger mausoleum on the right belongs to the Sultan Suleiman the Magnificent. In 1566, the aging sultan went on one last military campaign to Szigetvar, where he died silently in his tent. His clever Grand Vizier knew that the army would disband if they found out their leader was dead, so he covertly had Suleiman’s body mummified. Meanwhile, the Grand Vizier sent a note to Suleiman’s son, Selim (the one who led the unsuccessful for Turks Siege of Malta), telling him to grab the throne before another one of his relatives did. The sultan’s death was kept secret until after the army returned in victory to Istanbul, when his body was interred next to the mosque that bears his name. 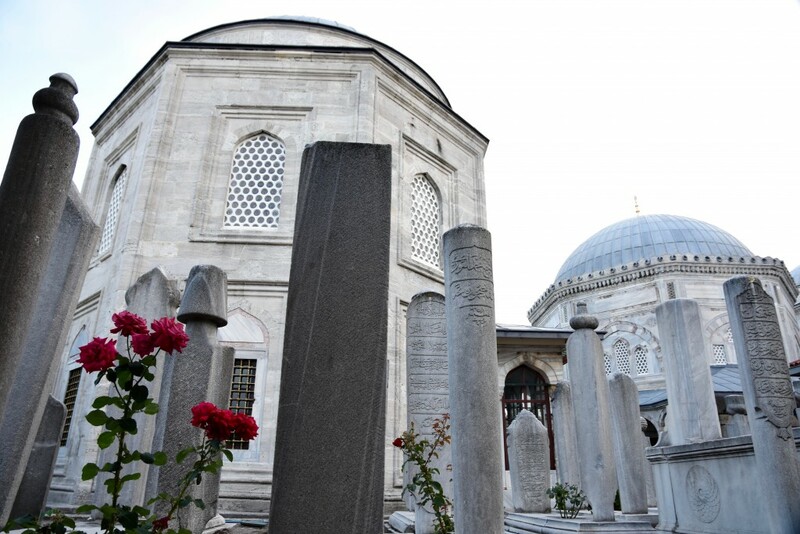 A year after Suleiman’s death, the best stonemasons and marble-workers in the empire, led by Sinan, came here to build a turbe or mausoleum, that would mirror Suleiman’s fame. 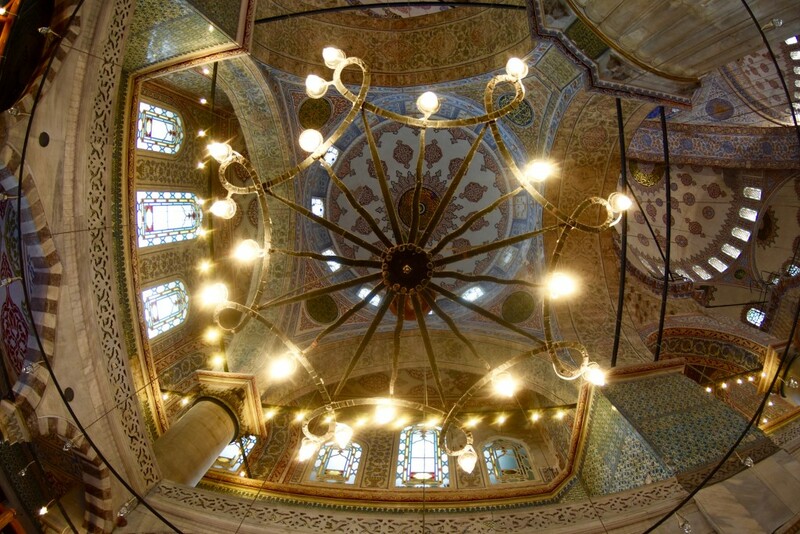 The mausoleum was considered complete when it was decorated with precious tiles from Iznik. Candles and oil lamps where lit, Suleiman’s robe was laid over the green cover of the ceremonial coffin, and imams began reading from Quran… and didn’t stop for years. One either side of the entrance are some of the most beautiful tile frames anywhere. Above the door are inscribed the words, “There is no other God but Allah, and Muhammad is his Prophet”. The larger cenotaph at the center of mausoleum is Suleiman’s. On either side are his two heirs, their relatives and Suleiman’s and Roxelana’s daugher (to his right). The room is hands-down gorgeous, from floral Iznik tiles, to marble paintwork, from beautiful woodwork on the windows and door shutters to decorative ostrich eggs and colored replicas hanging from the ceiling. The entrance to Roxelana’s mausoleum is to the right. While not as impressive as her husband’s, it also worth a look. Pay attention to the attractive tules as well as the “stalactites” decorating the niches between the windows. Roxelana’s cenotaph is the first one, surrounded by an attractive inlaid wood panel. Don’t be shy, come and take a closer look at the workmanship – thousands of tiny wood pieces were studded in to create its elegance. 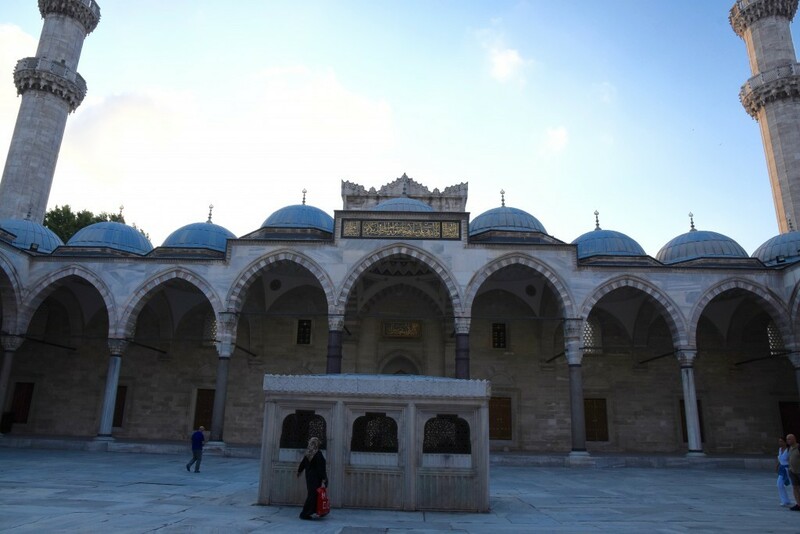 Like the rest of the Suleymaniye complex, the inner courtyard was designed by the architect Sinan. He was a master of creating spaces that were at once plain and tranquil. 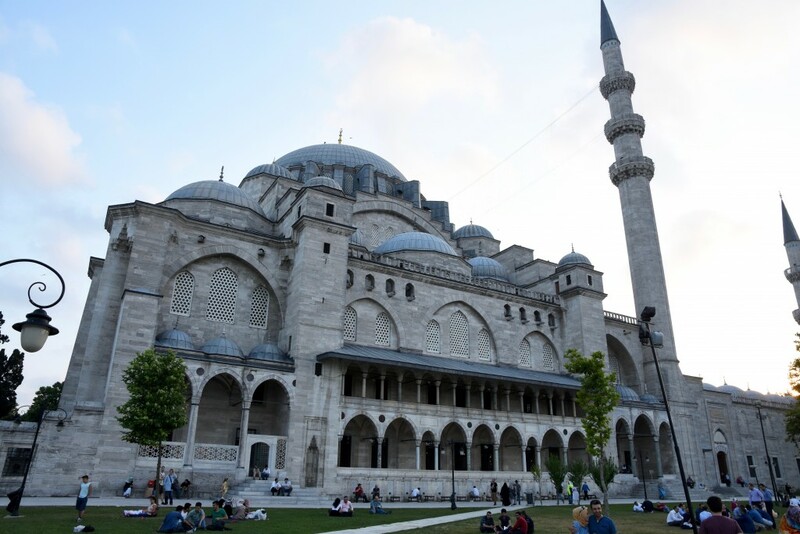 Looking around the courtyard, it is easy to appreciate Sinan’s command of architectural grace: it is not ostentatious, but the surrounding porticos and soaring minarets make it feel appropriately majestic. It is truly one of the Islam’s finest mosques. Similar to the Blue Mosque, the domed porticos around the perimeter look decorative, but they are also functional, providing shade in summer and shelter in winter. The old marble fountain in the middle of the courtyard was used for ablution. The main gate of the courtyard is across from the entrance to the mosque. Pay attention to the first shutters on either side of the entrance and the windows above them. These appear identical to the other shutters around the courtyard, but they actually hide the entrance to a special chamber used by astronomers, who had the important responsibility of calculating the exact time for worship, five times each day, based on the position of the sun. The Mosque has 4 minarets symbolizing the initial four caliphs and a total of 10 balconies on those minarets (said to represent the fact that Suleiman was the 10th sultan after the establishment of the empire). The interior of the Mosque is pure tranquility, somehow the seemingly plain pastel decoration and tasteful stained-glass windows merge in a harmonious whole. The impressive dome, flanked by two semi-domes as at Hagia Sophia, is 53 m high and has a diameter of 27.5 m. While Renaissance architects in Europe were struggling to sort out the basic technical difficulties of building domes, Sinan succeeded in creating an elegant, masterful dome that included such niceties as open earthenware jars embedded between the brick layers to enhance acoustics. The interior decoration is subtle, with very restrained use of Iznik tiles. The white marble mihrab and mimbar are also simple in design, and woodwork is restrained, with smooth designs in ivory and mother of pearl. Needless to mention, the Suleymaniye complex, since it was located on the hill, offers fantastic views of the Golden Horn and Bosphorus. By the time we left the mosque, it was nearly perfect pre-sundown time, so Nico took us to the best place to see the sunset, in new town – at the rooftop of the Marmara Pera Hotel. We arrived at the same time as a large group of German visitors, who apparently had a non-alcoholic event at the roof. There was a small pool, but unfortunately nobody was using it and even though the place offered the best views of all of Istanbul (including the Galata Tower), it seemed to be still undiscovered by tourists. From the top, I could see the innumerable mosques and endless colorful houses, roof-top parties and boats rushing into ports. It felt as if Istanbul had no boundaries, it was the “city with no end”. While sipping cocktails and chatting, we witnessed the darkness slowly wrapping around town, meanwhile local citizens and Muslim tourists finally started to fill in the streets, to celebrate Ramadan. Day was over, but the party was in its inception. 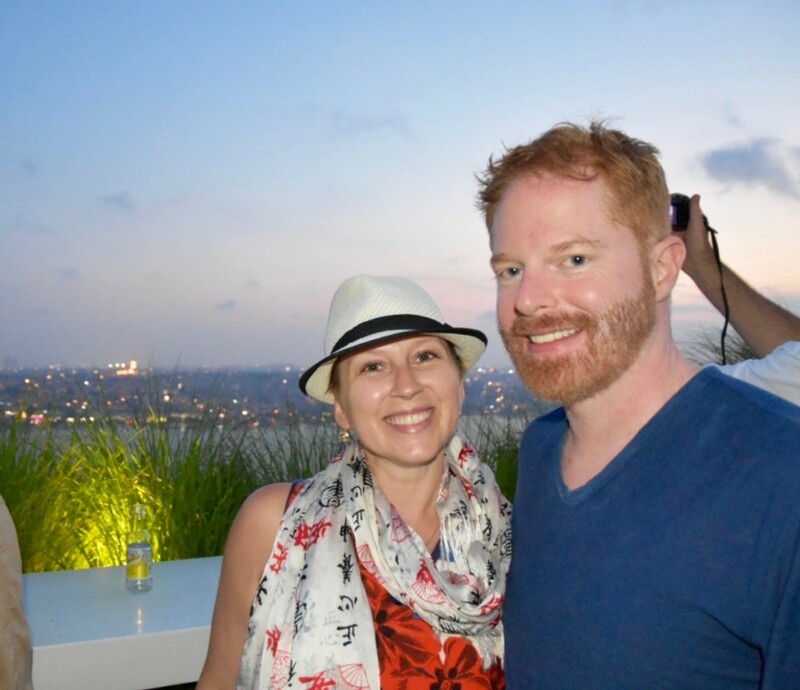 We were also lucky to run into Jesse Tyler Ferguson, an American actor and he was kind enough to pose for a photo with me. 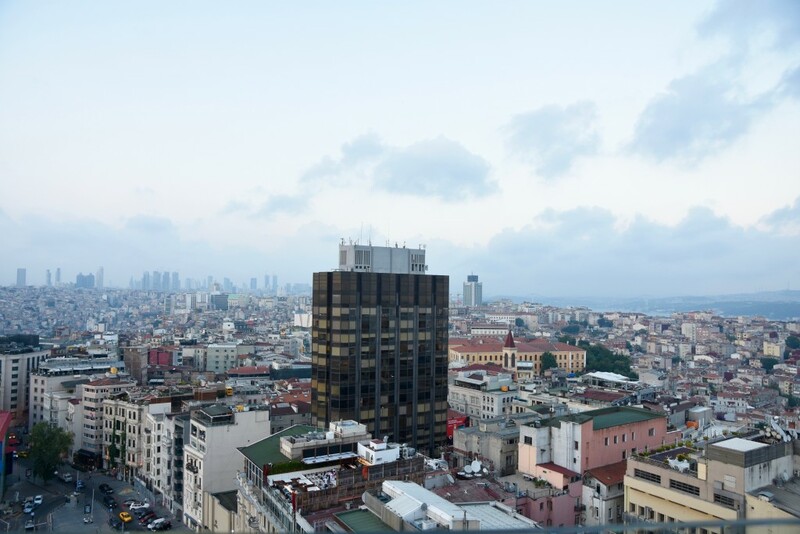 We were already in Beyoglu, a modern district of Istanbul, famous for its Taskim Meydani, street-side cafes, bustling nightlife and a non-stop flow of young Turks and foreigners. During the Middle Ages, it was known as Pera (meaning “Across” in Greek) and this name remained in common use until the mid-20th century. According to the prevailing theory, the Turkish name of Pera, Beyoğlu, is a modification of the Venetian ambassadorial title of Bailo, whose palazzo was the most grandiose structure in this quarter. The informal Turkish title Bey Oğlu (literally “Son of a Lord”) was originally used by the Ottoman Turks to describe Lodovico Gritti, Istanbul-born son of Andrea Gritti, who was the Venetian Bailo in Istanbul during the reign of Sultan Bayezid II (r. 1481–1512) and who was later elected Doge of Venice in 1523. The area has been inhabited for millennia, and records show that a settlement has existed there since the time of Christ. As the Byzantine Empire grew, so did Constantinople and its environs. The northern side of the Golden Horn became built up as a suburb of Byzantium as early as the 5th century. In this period the area began to be called Galata, and Emperor Theodosius II (reigned 402–450) built a fortress. The Greeks believe that the name comes either from galatas (meaning “milkman”), as the area was used by shepherds in the early medieval period, or from the word Galatai (meaning “Gauls“), as the Celtic tribe of Gauls were thought to have camped here during the Hellenistic period. 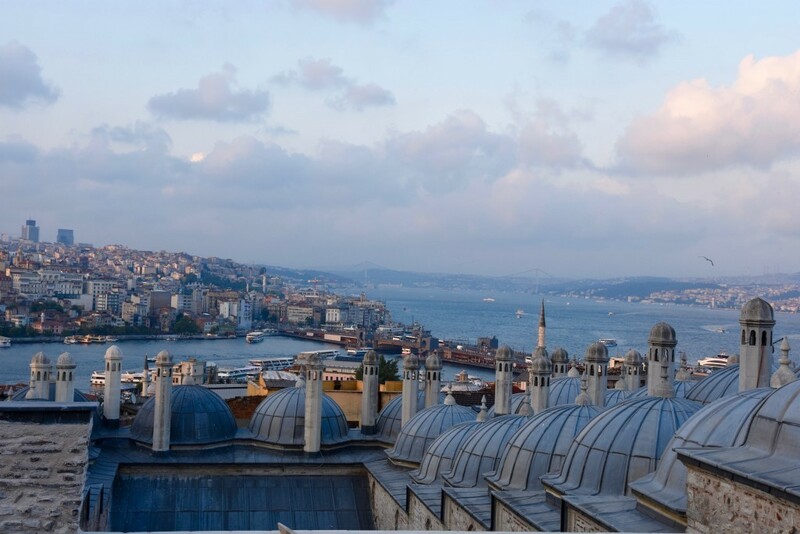 However, the name may have also derived from the Italian word Calata, meaning “downward slope”, as Galata, formerly a colony of the Republic of Genoa (between 1273 and 1453), stands on a hilltop that goes downwards to the sea. As the final stop of the Silk Road, Istanbul, for many centuries, has been the most important merchant city in the world and Beyoglu served as home to the city’s foreign residents, first – Genoese and Venetians, and later to Jews from Spain, Arabs, Greeks and Armenians. Even after the final conquest of Constantinople by Turks in 1453, European presence in the area didn’t end and with some modifications the trade went on mostly uninterrupted, for centuries. During the 19th century it was the most Westernized part of Istanbul, since many European companies and embassies, chose this part of the city, especially along the Grande Rue de Péra (today İstiklâl Avenue) as their base. This allowed for influxes of modern technology, fashion, and arts. Beyoğlu was one of the first parts of Istanbul to have telephone lines, electricity, trams, municipal government and even an underground railway. The theatre, cinema, patisserie and café culture that still remains strong in Beyoğlu dates from this late Ottoman period. Shops like İnci, famous for its chocolate mousse and profiteroles, predate the founding of the republic and survived until recently. The foreign communities also built their own schools, many of which went on to educate the elite of future generations of Turks, and still exist today as some of the best schools in Istanbul. Impressed by the modernization, Sultan Abdülmecid (rule 1823 – 1861) stopped living in the Topkapı Palace and built, in 1856, a new palace near Beyoğlu, called the Dolmabahçe Palace, which blended the Neo-Classical, Baroque and Rococo styles. When the Turkish Republic was founded, Beyoğlu went into gradual decline, which accelerated after the Armenian Genocide of 1915 and with the departure of the large Greek population of Pera and adjacent Galata (due to the conflict in Cyprus in 1950s-1960s). Interestingly, my husband’s grandfather was a Greek from Constantinople, and he left Istanbul around the same time. By the late 1980s, many of the grandiose apartment-blocks, formerly the residences of the late Ottoman élite, became home to immigrants from the countryside and the area had become economically and socially troubled. The first decades of the 21st century have witnessed the rapid gentrification of this neighborhood. Istiklal Avenue has once again become a destination for tourists, and formerly bohemian neighborhoods like Cihangir are again fashionable and expensive. Nico parked a car near the Marmara Pera hotel and on foot, we went to explore the most cosmopolitan and lively part of Istanbul. We passed by the Grand Hotel de Londres. Built by two partners, L. Adamopoulos and N. Aperghis, in the place of the former residence of Glavany family, this hotel in 1892 had the latest technology of the time, including a hydraulic elevator and bathrooms with tubs (according to rumors, tubs with jacuzzis). For many years it was the meeting place of intellectuals, travelers and curious people; even Ernst Hemingway stayed at this hotel in 1922 while covering a story for Toronto Daily Star. 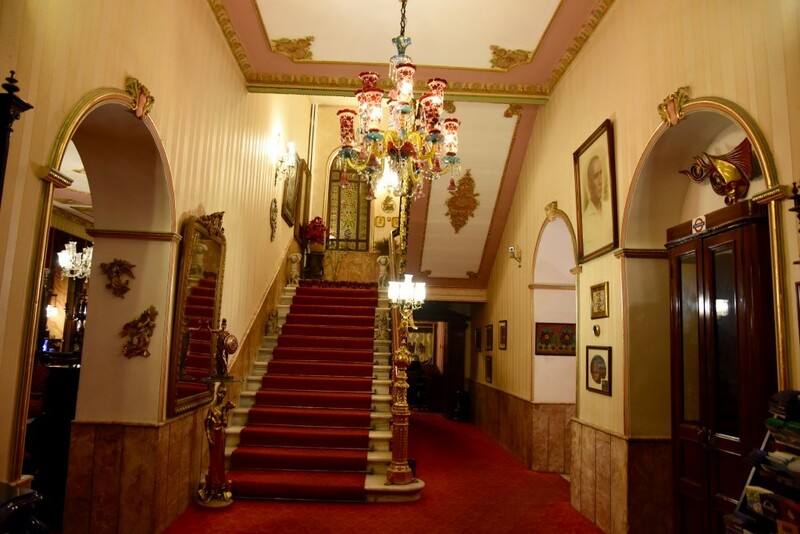 It might no longer be the most lavish accommodation in Istanbul, but it definitely is full of character and charm. Via winding and very busy streets, Nico led us to one of a million eateries that are located in the area. Until now, I don’t know how, in the first place, he got to visit the restaurant we were going to, as it looked just like any other on the street – alive with dozens of patrons, sound of music and cheers. Nevertheless, here we were, at the Krependeki Imroz. People at the restaurant seemed to know Nico, we were quickly seated on the second floor and brought a whole variety of food to see, smell and order. 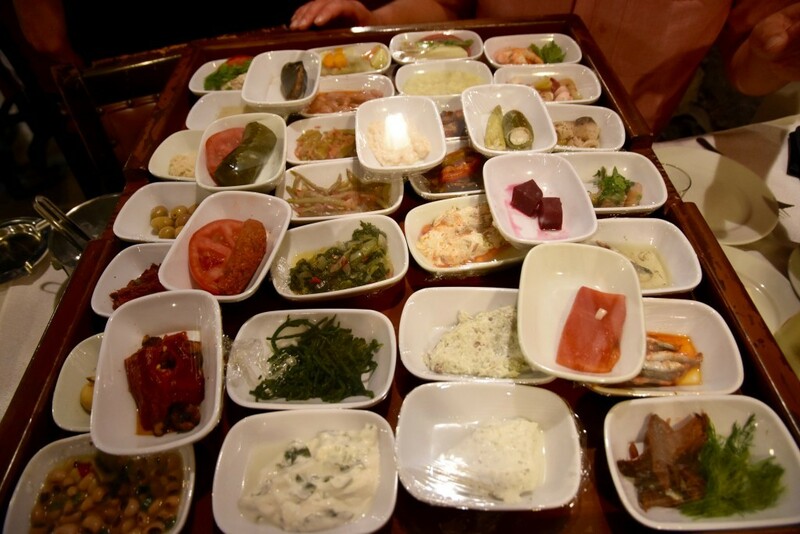 Turkish food is a whole topic on its own and since I spent so little time in Turkey, I am definitely not an expert. Let me say that we ordered pretty much 3/4th of everything presented. As wine and raki flowed, one dish quickly replaced another, Nico, Tanya and I have finally got time to relax and discuss everything we’ve seen today. I was in definite owe about the city and its sights, wishing the night would never end. And indeed, Nico had something up his sleeve and that was a visit to his favorite Blues bar in the area. 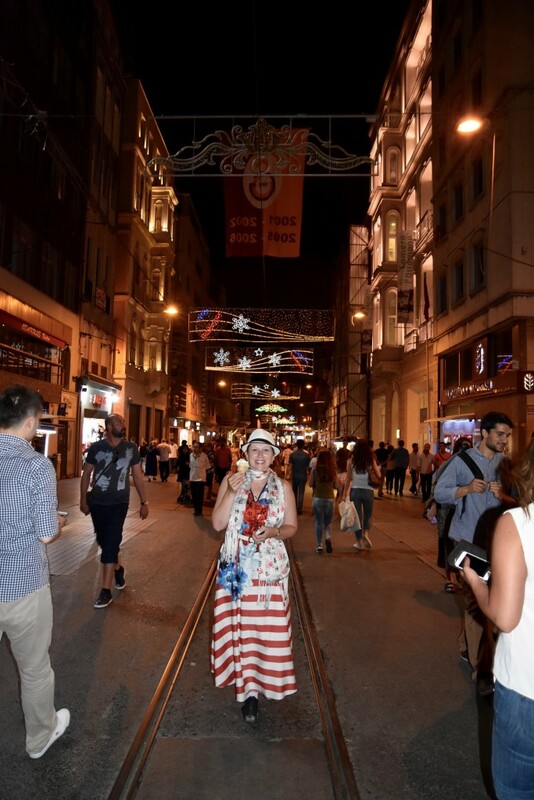 After we finished dinner with a juicy slice of watermelon, we took a walk along the new city most popular avenue – Istiklal Caddesi. Once called the Grand Rue de Pera but renamed Istiklal (Independence) in the early years of the Republic, Beyoglu’s premier boulevard is a perfect metaphor for 21st century Turkey. A long pedestrian strip cluttered with shops, cafes, cinemas and cultural centers, it showcases Istanbul’s Janus-like personality, embracing modernity one minute and happily bowing to tradition the next. This 1.4 km long avenue is said to be visited by 3 million tourists on every weekend day. Tanya and Nico, suggested ice-cream, all along knowing that you are not just buying ice-cream, you are buying a show. I naively agreed and had to pay with my own dignity laughing all the way through the performance. If you still don’t know what I am talking about, go ahead and order an ice-cream on Istiklal Caddesi, I don’t want to spoil your experience. We ended the night on a high note at the KumSaati Blues Club. I was definitely tired and out of words, but there couldn’t have been a better place to finish my 24 hours in Istanbul but listening to a very good music surrounded by like-minded young and good-looking people, both Turks and foreigners. The next morning, I got up early and spent a few hours browsing the old streets of Sultanahmet. I bought some famous Turkish baklava for my mom and a map of Constantinople circa 15 century (at the antique shop) for D. My comment about the Turkish men still stands, they were still the most annoying people you would want to deal with, especially when they think you are from Eastern Europe. On pretty much every corner I had to reply to a Turkish man calling me in Russian “русская девушка”, in English, telling them that I, in fact, was an American. It was the largest spoiler, but I can’t wait to take a few weeks off and go back to Istanbul again. Güle güle İstanbul, until next time. This entry was posted in Europe and tagged Ahmad I, Anthemius, Anthemius of Tralles, Ares Hotel, Armenian Genocide, Ataturk, baklava, Belarus, Beyoglu, Blue Mosque, Bosphorus, Bosphorus Strait, Byzantine, Byzantine Empire, Byzantium, Christ as Pantocrator, Christianity, Codex Justinianus, Constantine, Constantine XI Palaiologos, Constantinople, Corpus Juris Civilis, Diocletian, Divan Yolu, Enrico Dandolo, Fourth Crusade, Galata, Galerius, German Fountain, Golden Milestone, Grand Hotel de Londres, Grand Palace, Great Palace, Greek city, Hagia Sophia, Hippodrome, Hippodrome of Constantinople, Iconoclast Era, İnci, Islam, Istanbul, Istiklal Caddesi, Iznik tiles, Jesse Tyler Ferguson, Justinian, Justinian I, Kaiser Wilhelm's Fountain, Krependeki Imroz, Kum Saati, KumSaati Blues Club, Leo VI, Marmara Pera Roof, Mehmed II, Mehmet II, Michael VIII Palaeologus, Mustafa Kemal, New Yorker, Orient Express, Orthodox Christianity, Osman, Ramadan, Roxelana, Sedefkâr Mehmet Ağa, Seljuk, Seljuq, Serpent Column, Silk Roads, Sphendone, Suleiman the Magnificent, Suleymaniye Mosque, Sultanahmet, The Big Dig, Theodora, Theodosius, Turkey, Turkish Airlines, Turkish men, Walled Obelisk, weeping column. Bookmark the permalink.